This is a cassette deck introduced in 1979 by an austrian company who's best known for their film camera products, eumig (Elektrizitats Und Metallwaren Industrie Gesellschaft mbH. 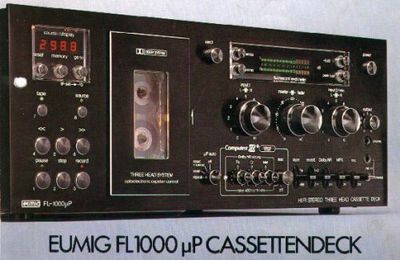 in Wien) Exellence both in engineering and styling combine in the Eumig FL-1000 to create a cassette deck with unexcelled performance, versatility, and elegance. 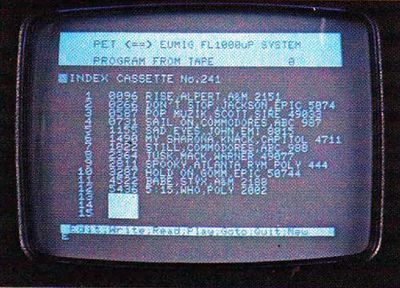 The front-loading, microprocessor-controlled tape transport featureas Eumig's exclusive opto-electronic servo system and a sophisticated 3-head esign that lets you monitor directly from tape as it is recorded. Built-in test facilities permit optimizing performance for every tape type and brand, including the new metal-alloy formulations. 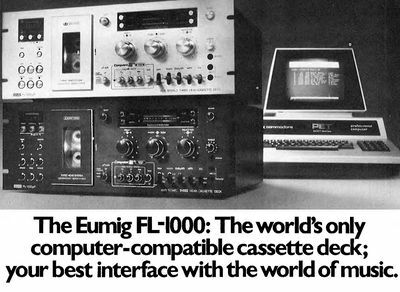 Eumig innovation developed the opto-electronic capstan servo-control system used in the FL-1000. Traditional flywheels respond slowly and may induce rumble. The lightweight Eumig disc, with its 2500 precisely-spaced, photo-etched radii, on the other hand, produces 15,000 pulses per second as the capstan rotates. 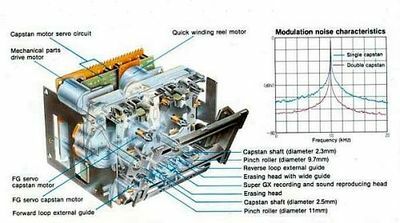 By comparin the counted pulse-rate against a fixed refernce, instantaneous speed-correction signals can be applied to the capstan within microseconds, helping lower the wow and flutter to a mere 0.035% WRMS. 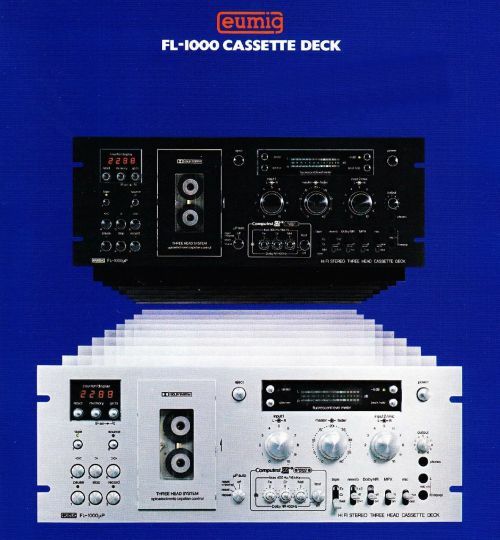 ​The FL-1000 incorporates not only the usual 3-position "bias/equalization" switch but also a built-in Computest facility that provides individual adjustments for sensitivity and bias for cassettes of each type. 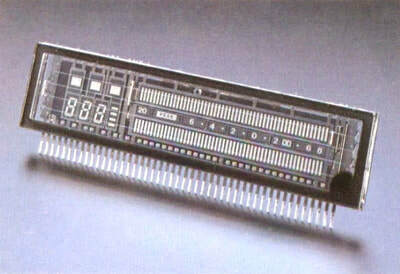 When the Computest switch is engaged, normal machine inputs are bypassed, and the letter "t" appears on the digital readout. 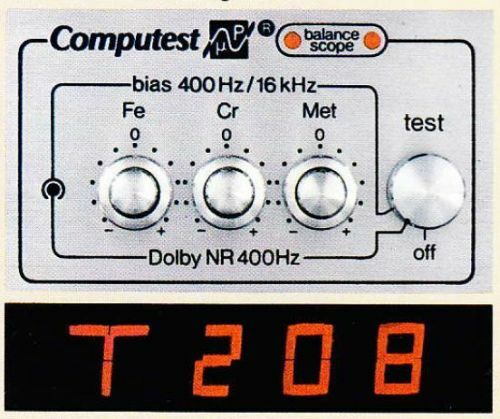 A 400Hz test tone is used to set sensitivity for proper Dolby level, and a combined 400/14,000Hz tone permits bias adjustment for a flat frequency response across the entire audio range. Both test positions use a Balance Scope, consisting of two LEDs which flash equally and alternately when the correct setting is achieved. 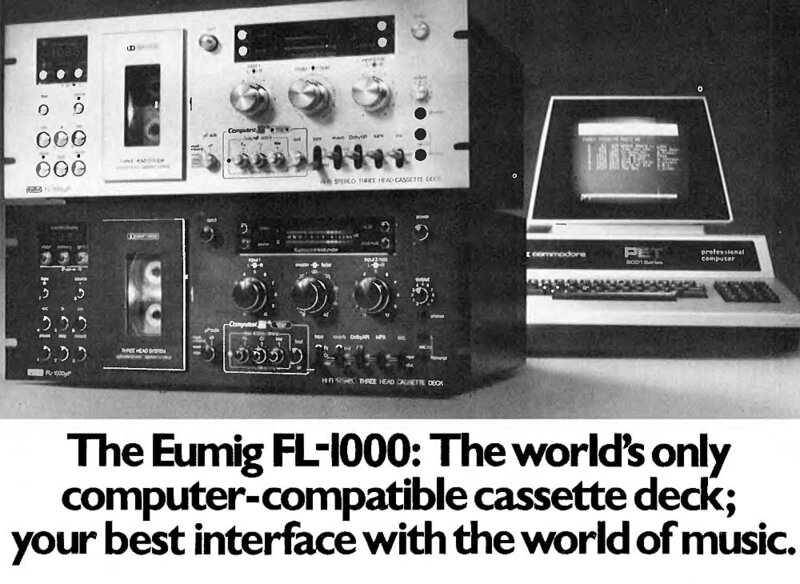 Unique among audio components, the Eumig FL-1000 cassette deck can be directly interfaced with almost all 8-bit computer systems (1979), such as the Commodore "Pet", Apple II, Radio Shack, etc. 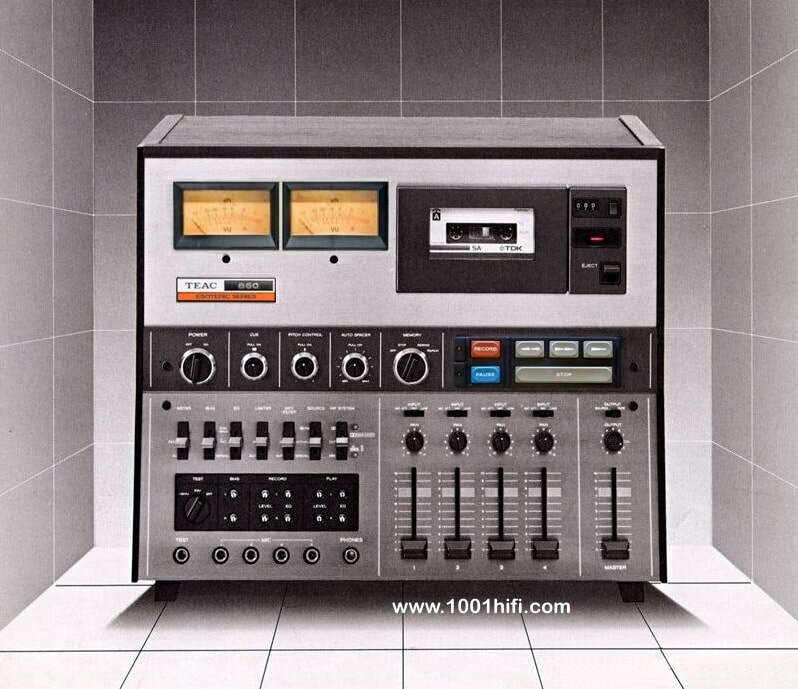 With the multi-machine control program, up to 16 FL-1000's can be individually controlled, simultaneously or sequentially, for any mode and any section of any tape. 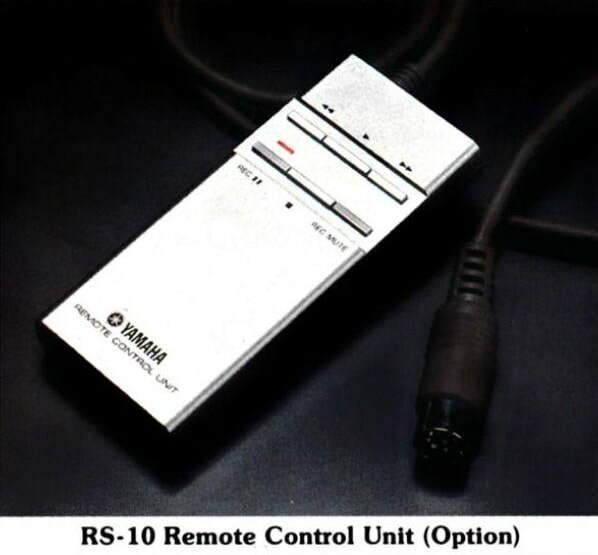 You can control each and every function of the FL-1000 including record, play, stop, rewind, fast forward, load counter, load memory, go to and many more. 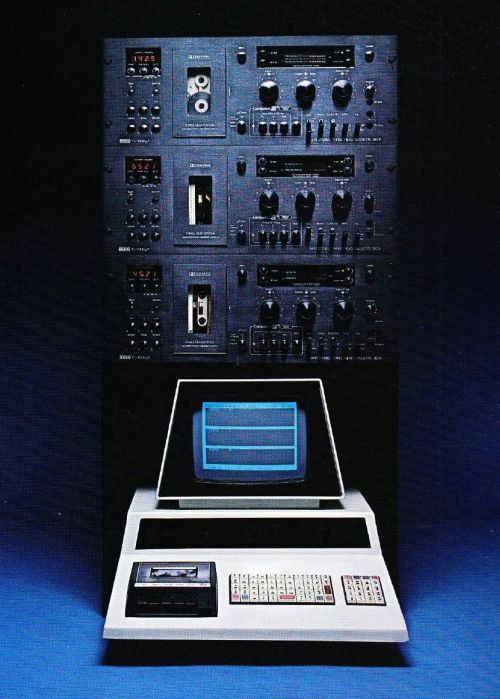 While the multi-machine control program will probably find principal use in commercial applications such as broadcast station or discotheques, even the owner of a home computer will appreciate index program facility that computer interface with FL-1000 provides. 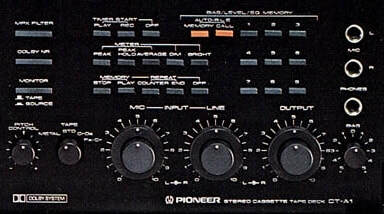 Under computer direction, the titles and locations of up to 15 selction per cassette side can be digitally recorded by the FL-1000 (subject, of course, to user change) on the first few seconds of each side of your cassette. 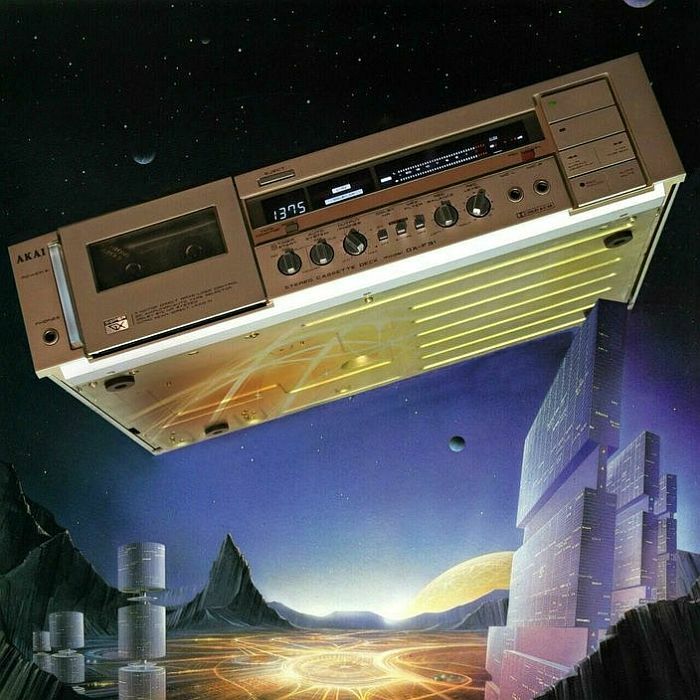 In this way, by merely inserting a prgrammed cassette in the FL-1000 and punching a few buttons on the computer, you can read out its contents on a CRT and instruct the FL-1000 to play the selections you wish to hear in any order - with, for example, a "rewind" command at the end of your musical menu. 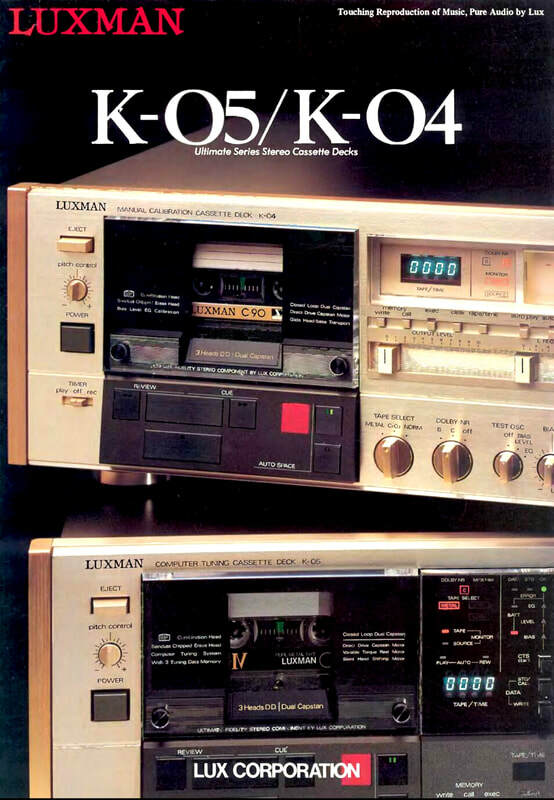 ​The K-05 and K-04 are the cassette decks developed under the ultimate yet essential proposition to realize ultimate fidelity reproduction of original sound. 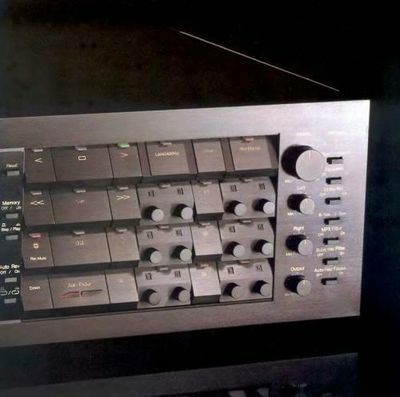 Most of the decks said to sound good accompany a certain colouration, and in many cases such particular atmosphere delivered by colouration is preferred in actual listening. 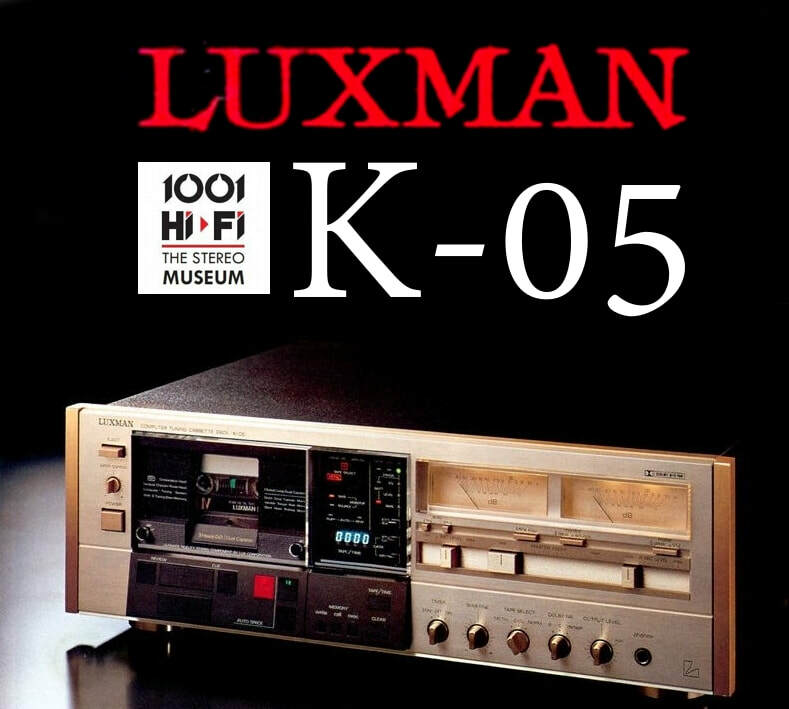 Dissatisfaction at such present status urged LUXMAN to design the top-notch deks K-05 and K-04. 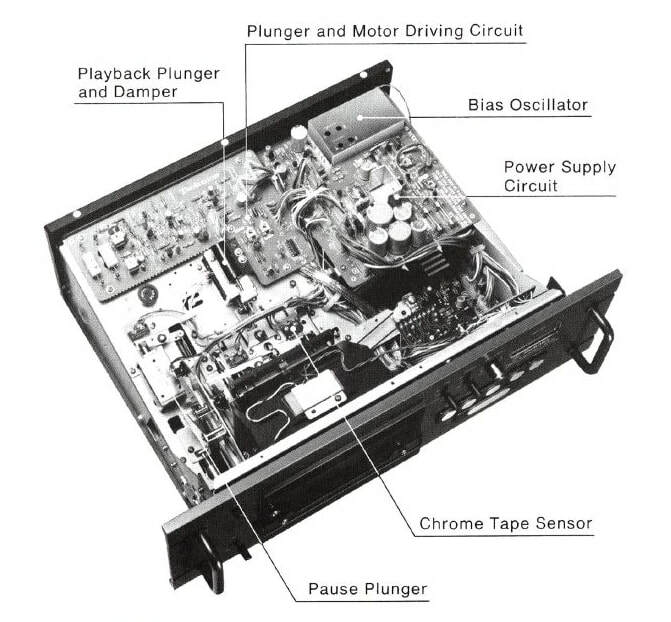 Tape travel mechanism is life of tape deck and determines whole sound quality. Good tape transport is a precondition for a good deck. 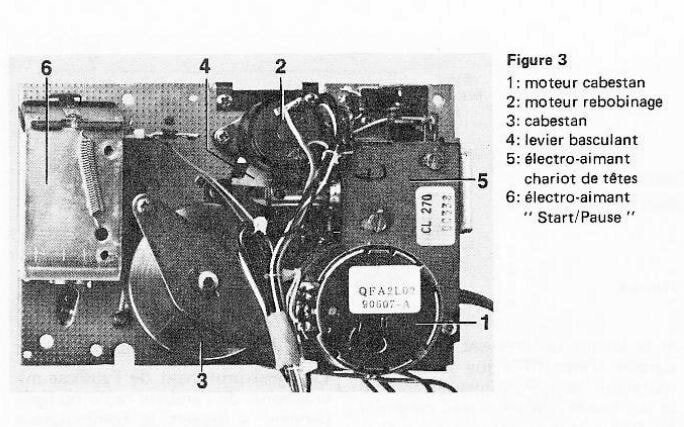 With the K-05 and K-04, the tape trasnport mechanism has been reviewed from the very begining not by means of such temporizing measure to provide ostensible reduction of wow & flutter with Direct Drive motor but by means of newly designed robust "G.T. 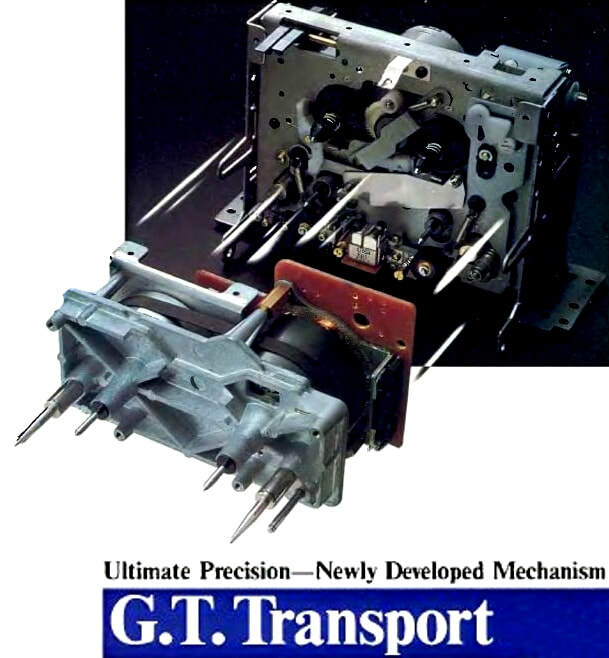 Transport" - Grand Trust Mechanism, which eventually brought about a dramatic improvement of total tape travel mechanism. Rustic, sturdy chassis made of thick die-cast zinc alloy is moulded and integrated with 2 pairs of capstan bearings, which assures perfect parallelism between the shafts of pinch-roller and capstan as well as their strict verticality to the chassis. 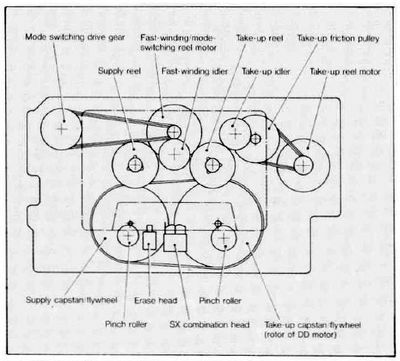 3-DD Motor Configuration, exclusive motor is arranged for each function of capstan drive, reel drive and head-assembly movement. 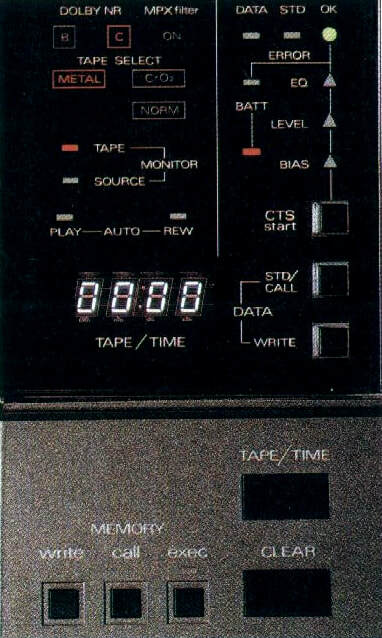 High quality recording and playback are made possible only by an accurate 3-dimensional control on tape contact. 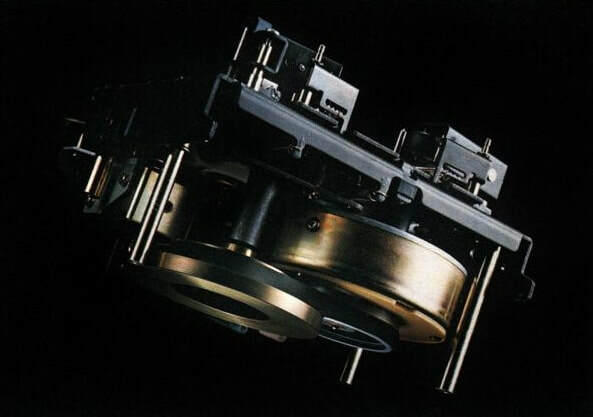 Many manufacturers put great emphasis on the zimuth adjustment (to parallel both the head gaps for recording and playback and to set them perpendicular to tape) With the K-05 and K-04, all of these conditions are fully satisfied on the basis of ultra-precison R/P combination head. 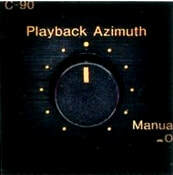 In the case of discrete 3-head system, the most critical point is in the azimuth control for the recording and playback heads. On the contrary, the R/P combination head has a big advantage that it can be fixed at the exact position in addition to its close positioning between the recording and playback head-gaps. 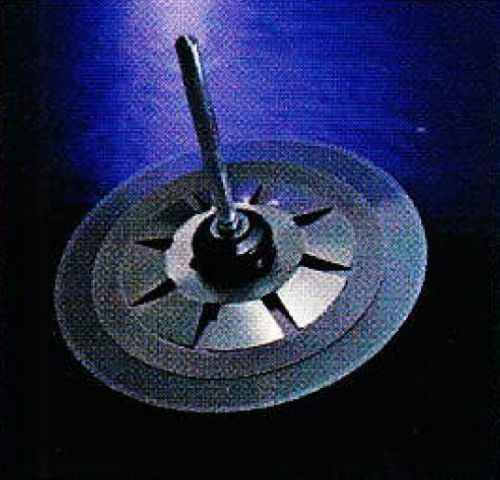 To make the most of this merit, during the manufacturing process of the head, its azimuth is aligned in the strictest manner by the unit of microns. 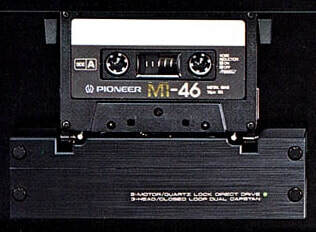 As commonly known, cassette tape has quality variations even in the same kind supplied under the same brand. To make most of its recording potential, an optimum value has to be selected for each bias current, tape-referenced recording level and equalization. In the case of the K-05 featuring automatic calibration system, the on-deck computer calibrates all of these 3 items individually then correlatively to locate the optimum points, confirming the result of each calibration step in the form of frequency response. Specifications K-05: 3 Head System - Record Sendust, Playback HIP (Hot Isostatic Press) Ferrite, Erase Dual-gap Sendust/Ferrite Junction. Wow & Flutter (JIS WRMS0 no more than 0.022%. Frequency response Metal 15 - 27.000 Hz, CrO2 15 - 22.000 Hz, Normal 15 - 22.000 Hz. Dimensions 460mm(W) x 361mm(D) x 158mm(H) Weight 11.5 kg. 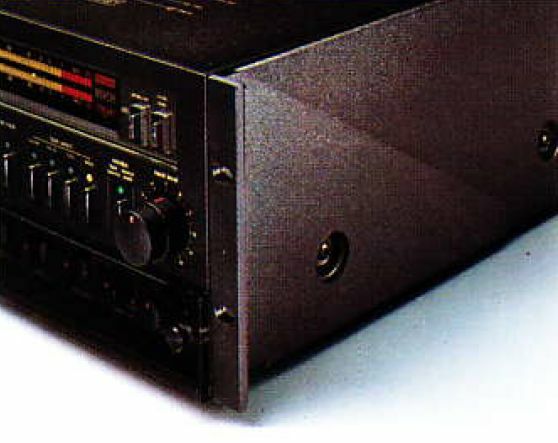 These two models were also available as ALPINE AL-85 and AL-90. 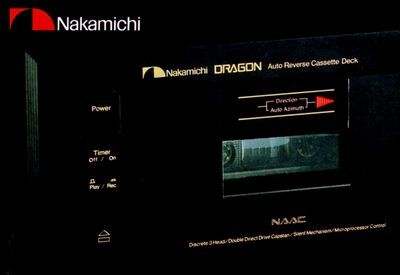 ​The Nakamichi Dragon cassette deck was an exciting combination of innovative design, convenience features and outstanding performance. 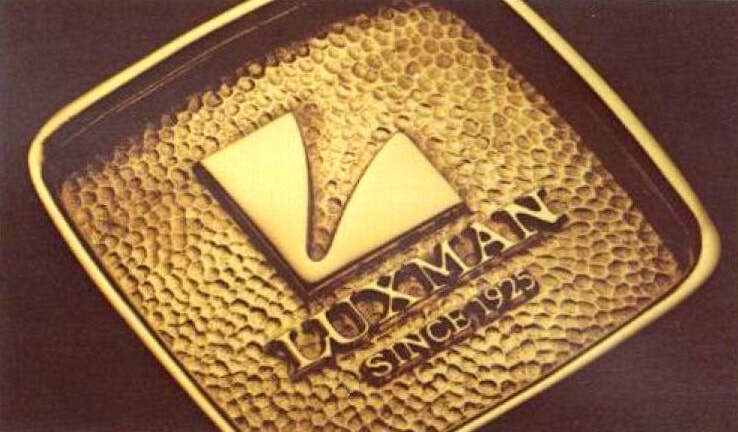 It was first introduced at $2,499 and it was targeted at serious high-end clientele until it was discontinued in 1993 after an 11-year production run. 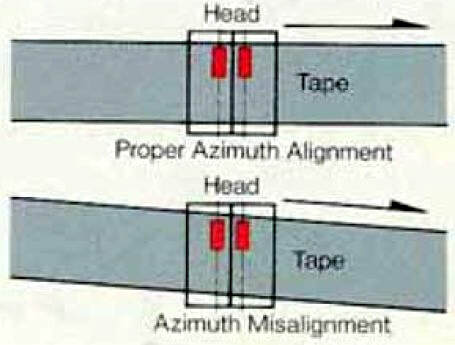 Because of Azimuth misalignment in tape reproduction high frequency response can be severely restricted. 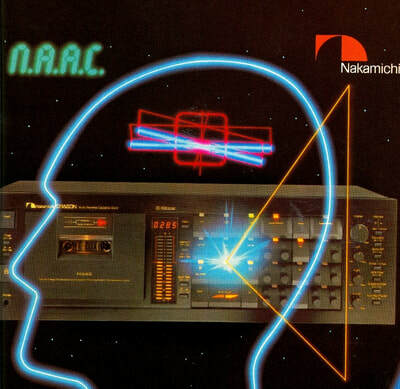 Nakamichi equipped this deck with a NAAC (Nakamichi Auto Azimuth Correction) system capable of extracting every bit of information stored on a cassette. NAAC automatically determines the actual recorded azimuth on the tape, aligns the playback head to it, and continues to track it throughout the program. 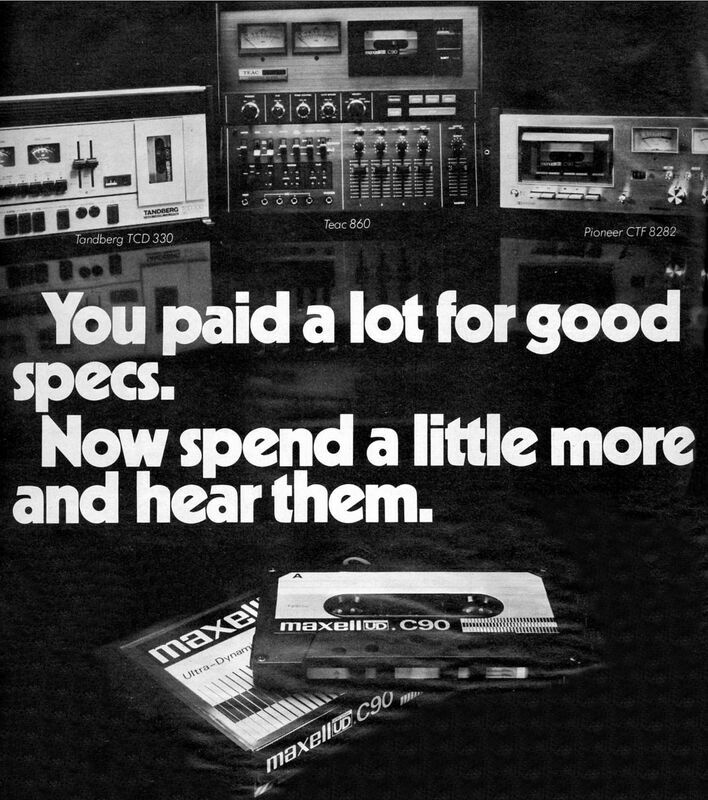 It works on comercially recorded tapes, tapes borrowed from a friend and even if the tape has been recorded with improper azimuth. 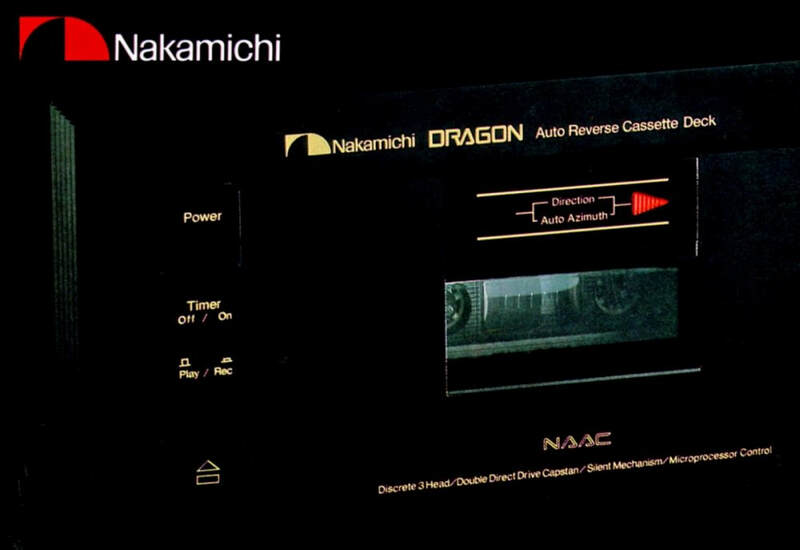 To exploit to the maximum tape performance, the Nakamichi Dragon was the world's first Dual-Capstan, Double-Direct-Drive, Auto-Reverse cassette deck. 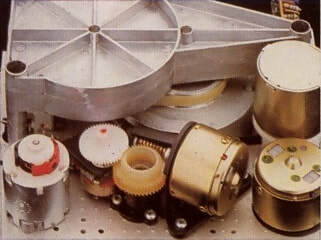 For speed stability this model uses two Super-Linear-Torque Quartz controlled direct drive capstan motors. 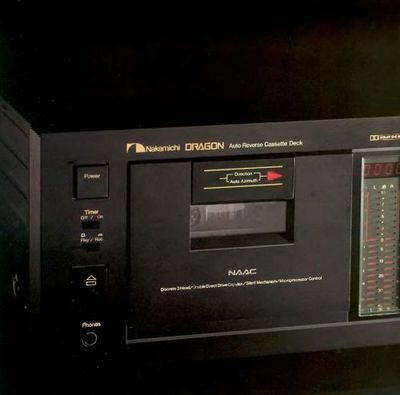 For optimum recordings the Nakamichi Dragon is provided with separate sets of bias and record-level (sensitivity) controls for each channel and tape type. 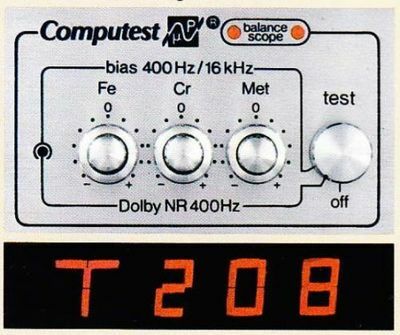 Self-contained test oscillators generates a 400 Hz signal for setting record level and a 15 kHz tone for adjusting bias. Technical specifications: 3+2 motor mechanism, Wow-and-Flutter is less than 0.019 WTD RMS, Frequency response 20 Hz-22,000 Hz (+/-3 dB, -20dB level) and Signal-to-Noise Ratio better than 72 dB with Dolby C and better than 66 dB with Dolby B. 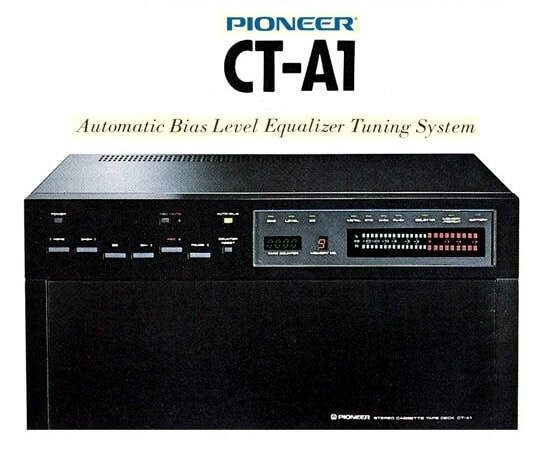 ​Introduced in 1979 the PIONEER CT-A1 is one of the top recorders of all time featuring a Quartz Lock Direct Drive Closed Loop Dual Capstan mechanism, 3 Head System and Automatic Bias Level Equlizer Tuning System. 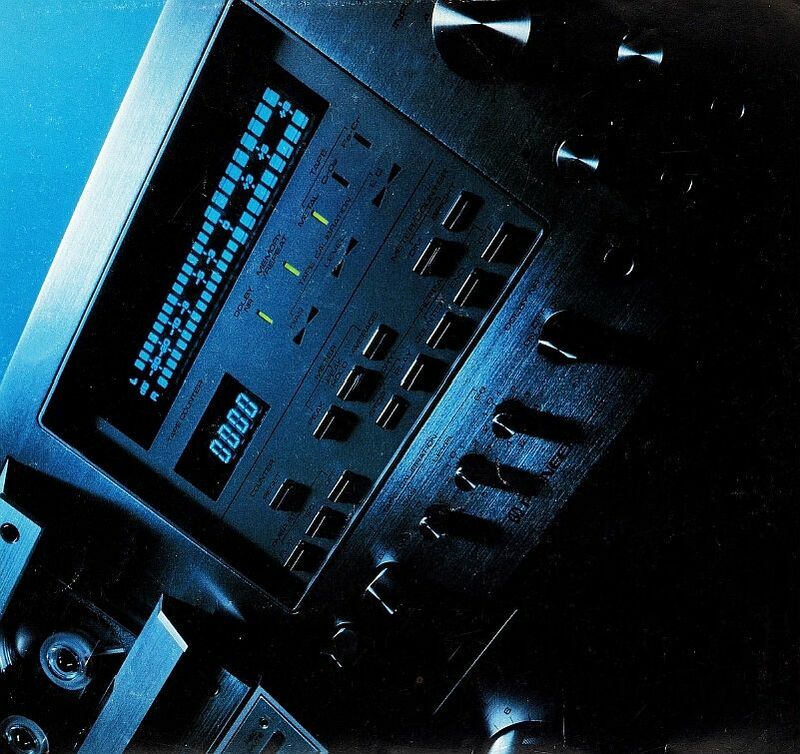 The CT-A1 can get the best out of every tape, because it has a microcomputer that works like a lab technician, testing each tape and making precise recording adjustments. The AUTO - B.L.E. 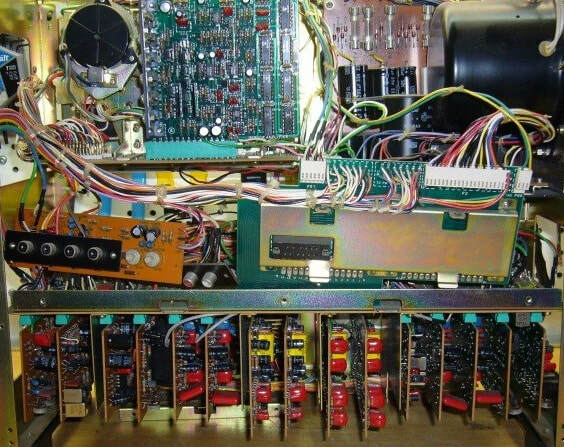 system automatically determines optimum bias/level/EQ, and stores this data for 9 different types of tape in its memory. Like a technician, AUTO - B.L.E. 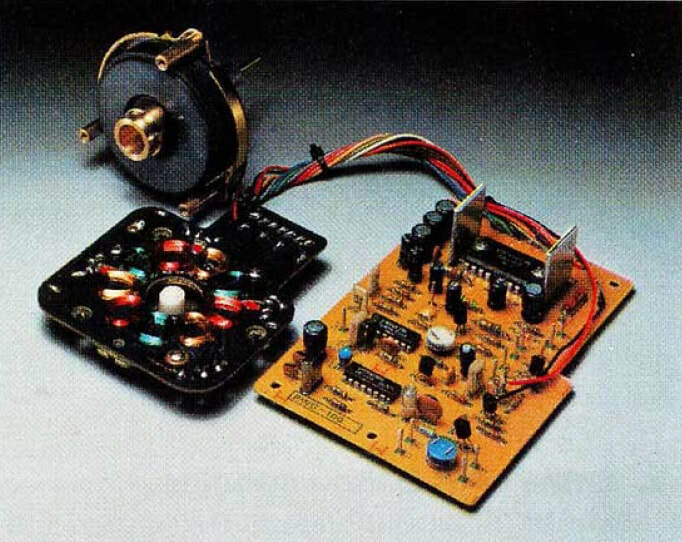 applies a test tone to the tape, then varies the bias current over 64 possible steps. 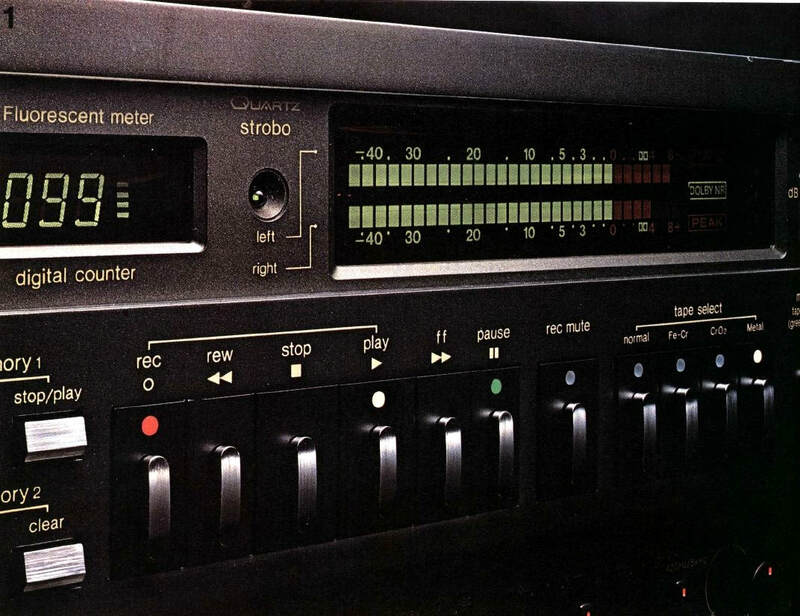 It then scans the tape in playback to determine optimum bias with an accuracy of +/-0.2dB. It sets optimum level and EQ the same way. 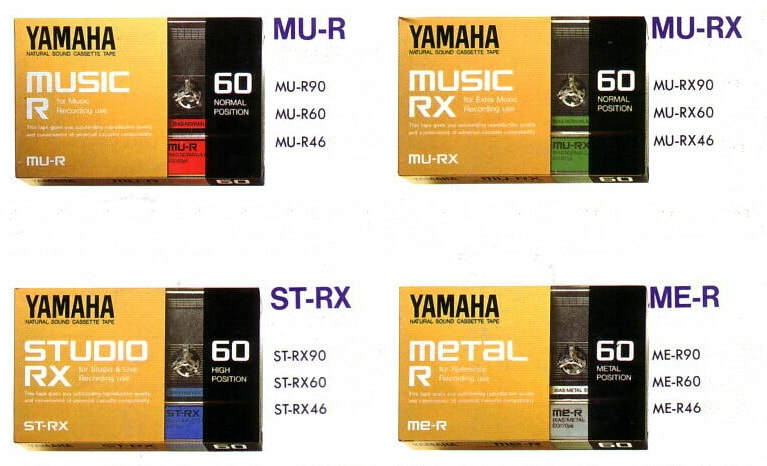 You get the most out of Metal, Normal, CrO2 and Fe-Cr tapes. And it takes less than 45 seconds. 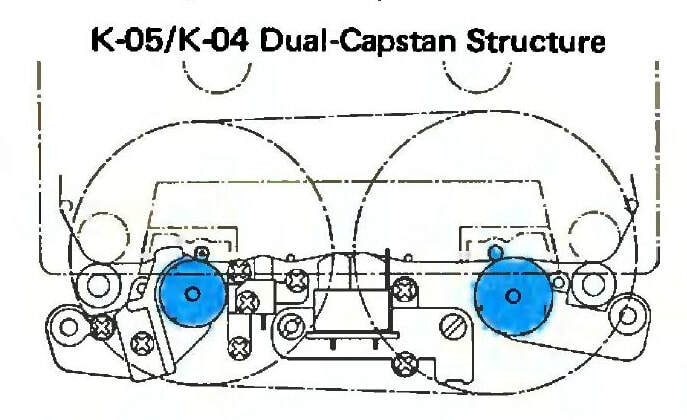 ​To avoid pitch variations the CT-A1 uses a dual capstan mechanism. 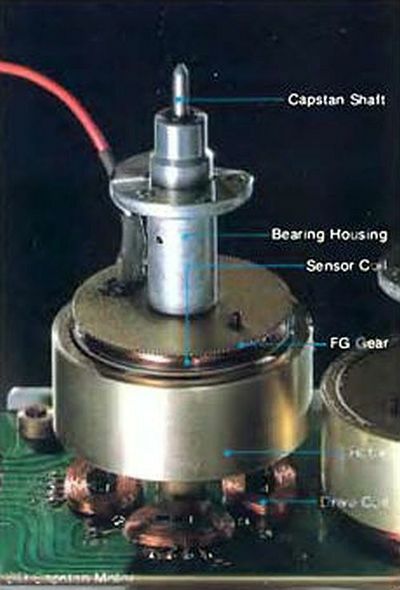 The "drive" capstan's speed is regulated by a quartz-phase lock loop system that detects any speed variations, and instantly corrects them. Speed drift is less than 0.02% and wow & flutter drops to an amazingly low 0.03% WRMS. 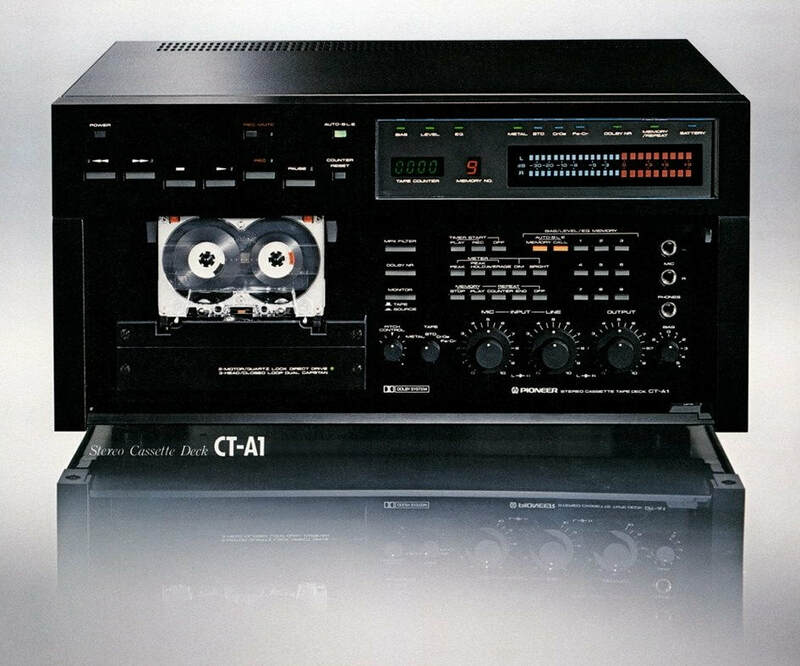 The CT-A1 out-performs all other cassette decks, and rivals the best reel-to-reel. 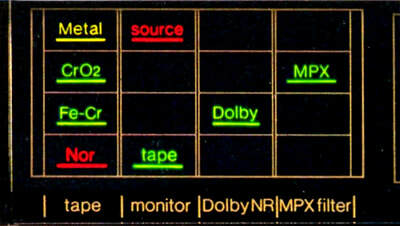 Signal to Noise with Dolby on is -70dB. 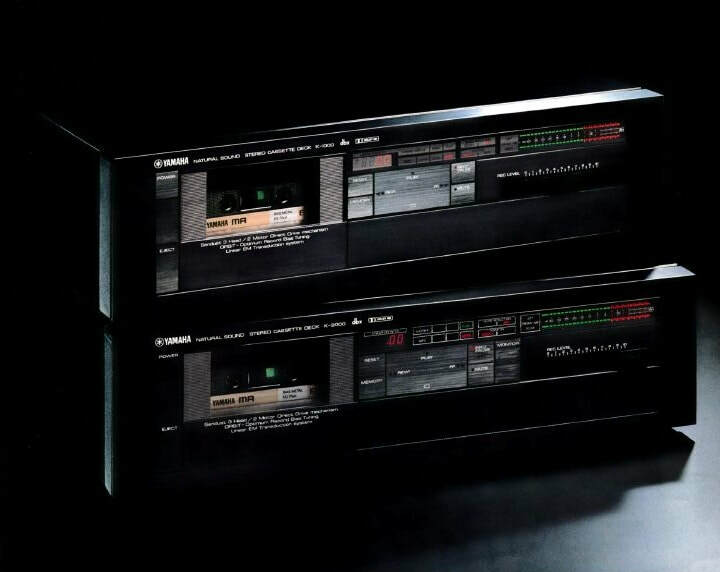 Double Dolby allows you to record with Dolby, while monitoring it with Dolby. 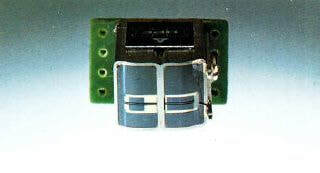 The 3-head system with Uni-Crystal Ferrite heads achieves a frequency response of 20Hz-20kHz, -20dB with metal tape. 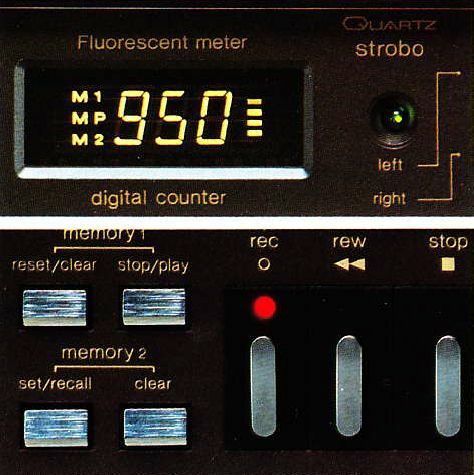 The fluorescent meter gives you 24-segment resolution for easy readings from -30dB to +8dB. Since PIONEER briefly acquired the Phase Linear company this model was available for a short time also as Phase Linear Model 7000 Series Two however these were silver models while the PIONEER models were all black. 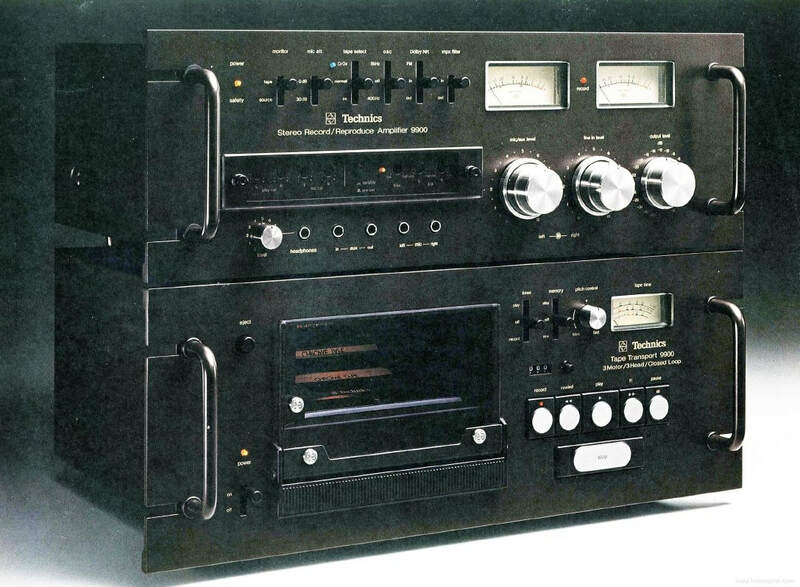 ​When PIONEER designed the new (1979) CT-F1250, they not only raised the performance standards of high quality decks, they also lowered the standard price. 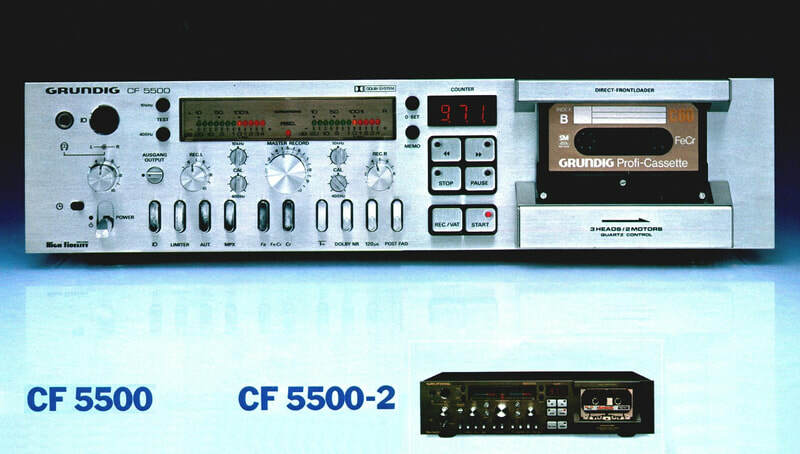 Instead ot the two heads found in most metal cabale tape decks (in 1979), the CT-F1250 has three. 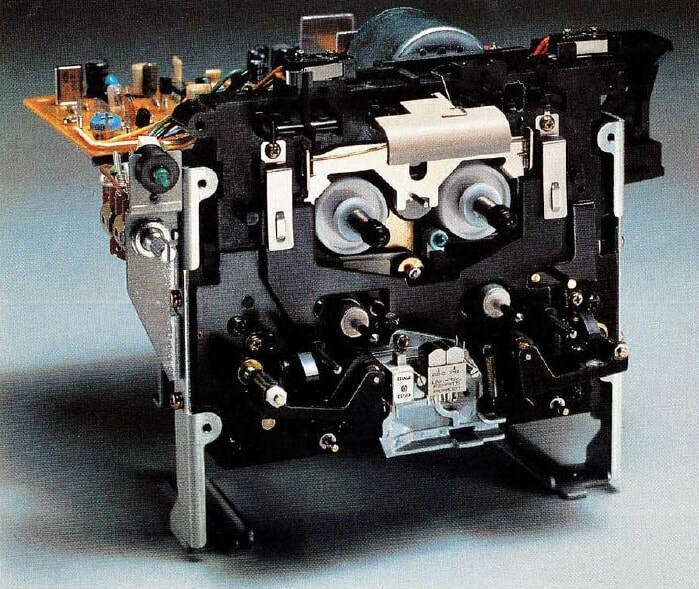 They are not simply modified for this advancement, the CT-F1250 has been specially designed for Metal tapes. The new "small window" erase head makes a big difference in making sure all metal tapes are wiped completely clean. 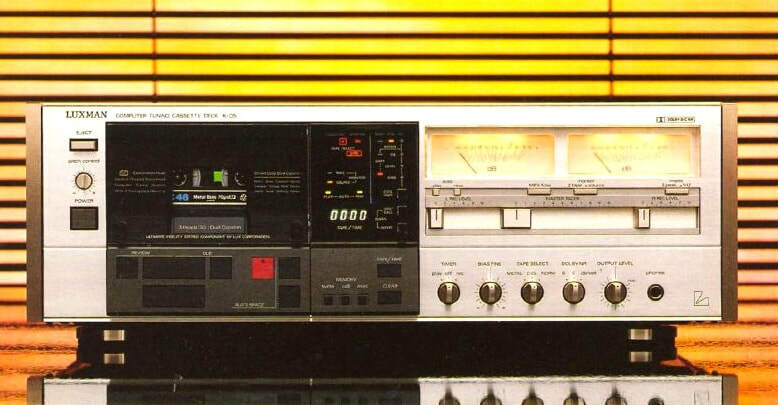 The Uni-Crystal Ferrite recording and playback heads give a greater frequency response and better wear-resistance than the ordinary ferrite and Sendust alloy heads you'll find on most other tape decks. 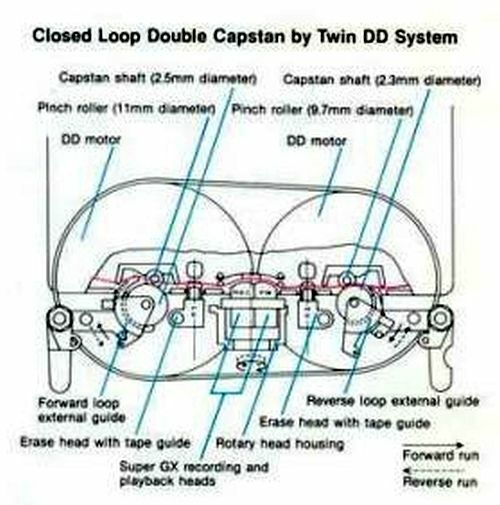 Instead of the single capstan transport, the CT-F1250 has a closed-loop dual capstan, similar to that found in the remarkable RT-909 open-reel deck. This system keeps the tape in perfect contact with the heads at all times. So you are assured of getting everything that's on the tape. Nothing more, nothing less. What's more, the CT-F1250 ha sa Quartz Locked Direct Drive capstan motor that senses the slightest deviation in speed and automatically corrects it to keep wow and flutter down to an unbelievable 0.03%. It's engineering innovations like these that make the CT-F1250 so remarkable. But equally remarkable are the features that make the CT-F1250 so remarkable. Like the specially engineered Tape Calibration System that lets you quickly set bias level, Dolby adjustment, and record equalization for the best possible signal-to-noise ratio, the lowest distortion, and the best high frequency response. 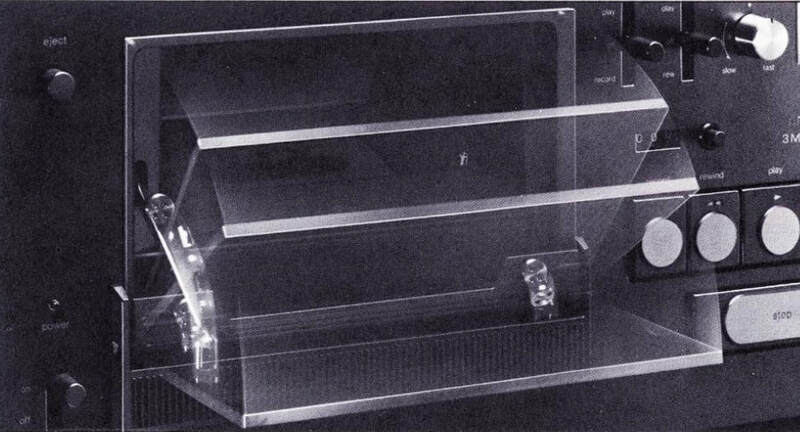 The 24 segment Fluroscan meter that works on PIONEER's own microprocessor to give a more accurate reading of what you're listening to. It even has Peak, Peak Hold, and Average Buttons that let you record without fear of overload. 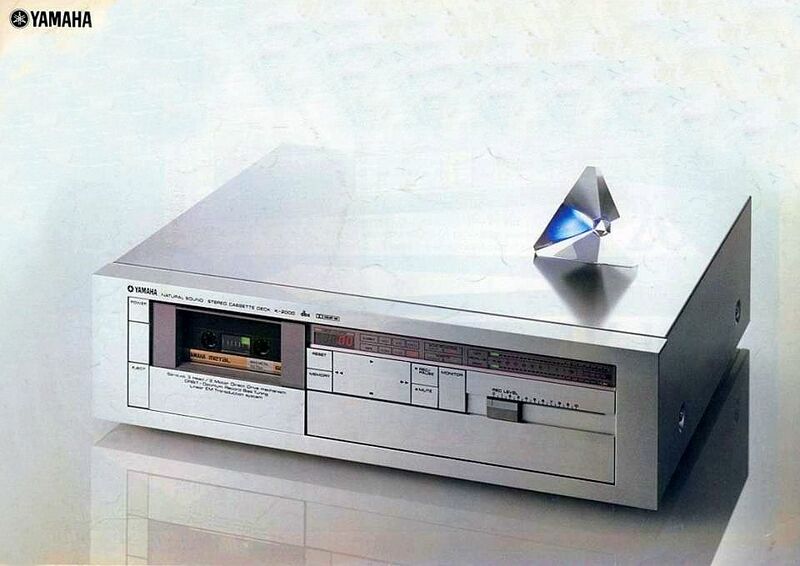 In addition the PIONEER CT-F1250 has a digital brain with a memory that controls four differnt memory functions. 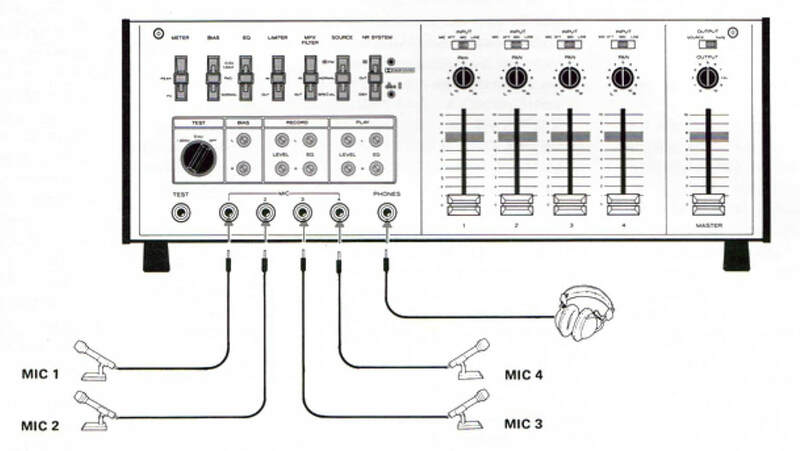 Plus pitch control. Mic/line mixing. 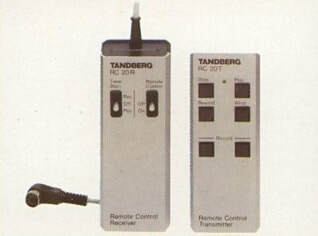 Independent left/right input/output controls. And more. 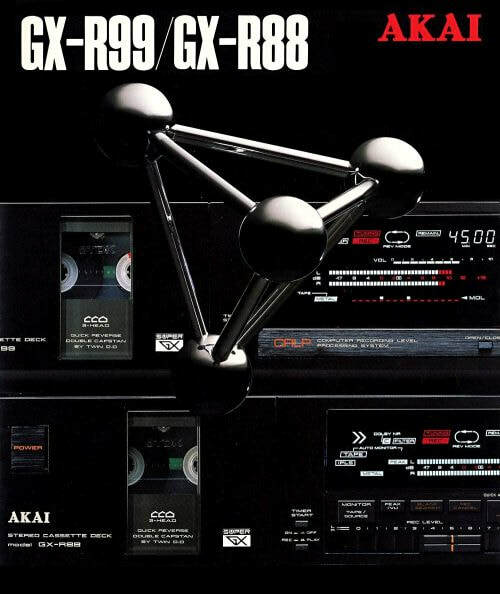 World First dbx Recorder. 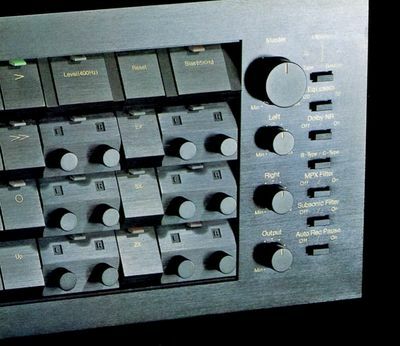 Advertised as having an expanded dynamic range of over 80dB the TEAC A-860 from 1976 was the first cassette deck in the world with built-in dbx II noise reduction system. Because background noise is reduced as much as 30dB, you can record at lower levels and still maintain the best possible signal-to-noise ratio. You get more headroom with less chance of tape saturation. The decks features and performance amply justify the company placing it in their "Esoteric Series" of components. 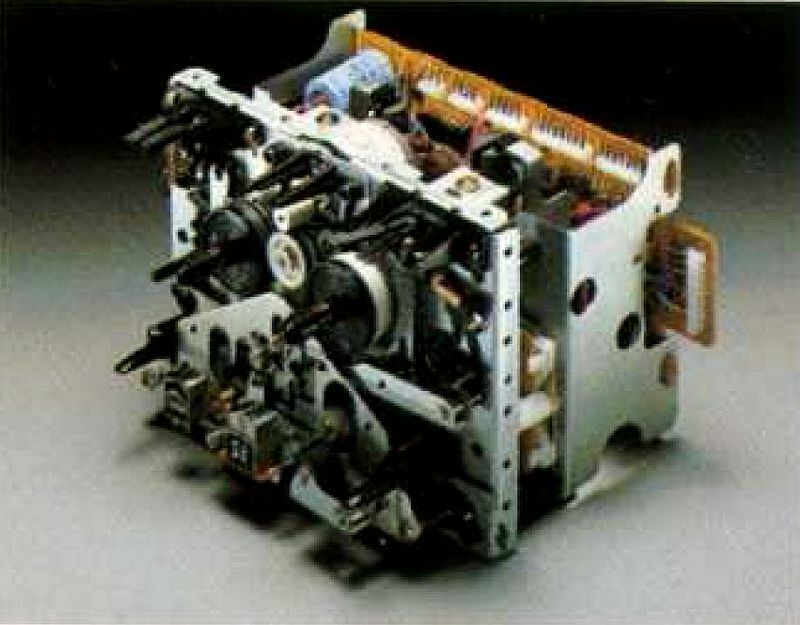 The transport system in the 860, designed by computer technologists and engineers, was the most sophisticated cassette transport. 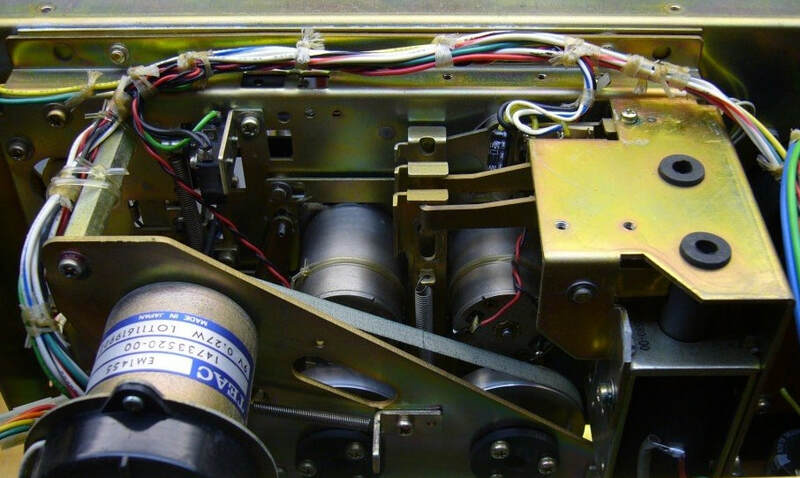 Three motors and dual capstan drive provides the most precise, most accurate movement of tape possible. At its eart is a Phase Locked Loop DC servo capstan motor. Virtually imprevious to voltage fluctuations, temperature or load changes, it joins with two DC reel motors to provide an incredible 0.04% WRMS wow and flutter. 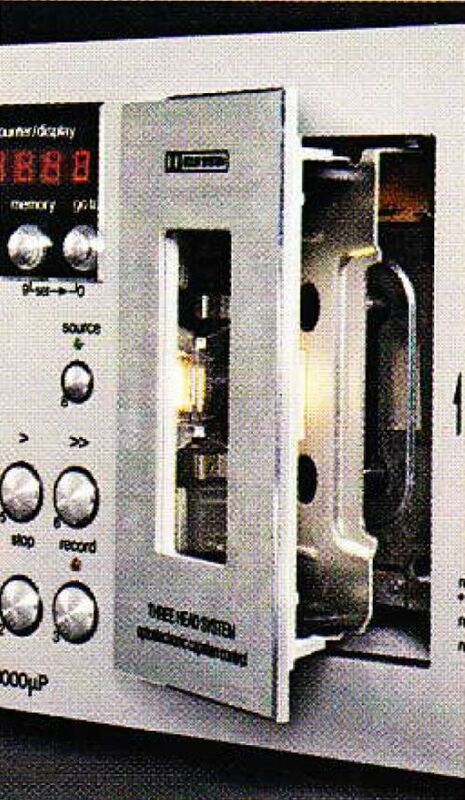 A newly designed dual gap record and reproduce head for three-head function completes this sophisticated tape transport. 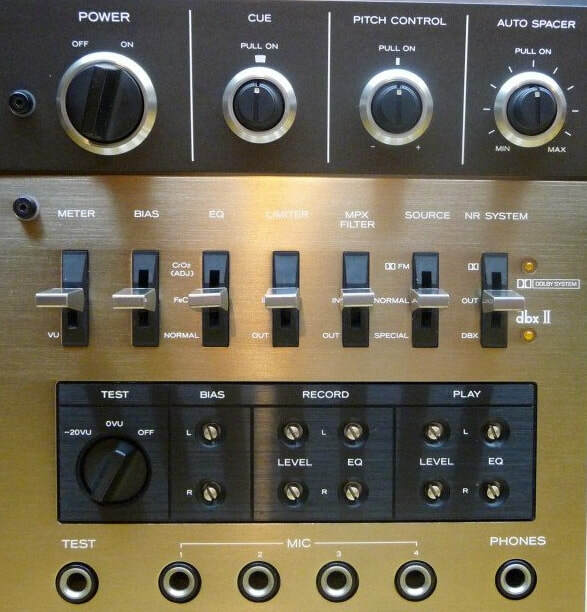 The front panel of the 860 also includes inputs for four mc or line lvele signals that can be mixed down to stereo or mono with the built in 4x2 mixer with pans. 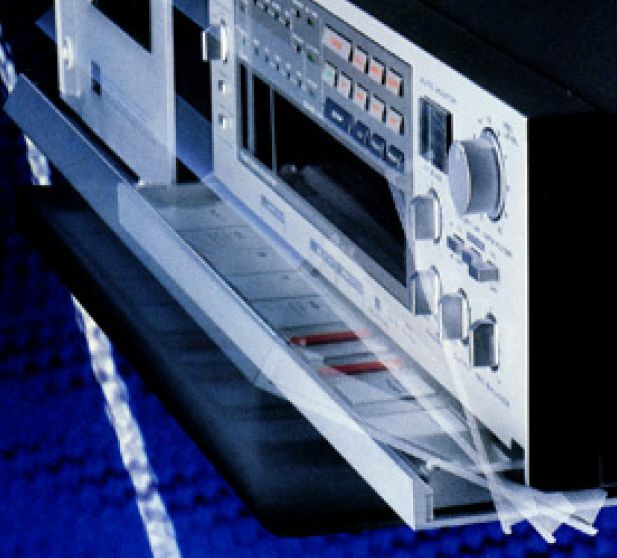 The 860 will provide best possible frequency response characteristics no matter what brand of tape you use. Three position bias and equalization switches and front panel calibration controls give you total flexibility and control over the record and reproduce electronics. 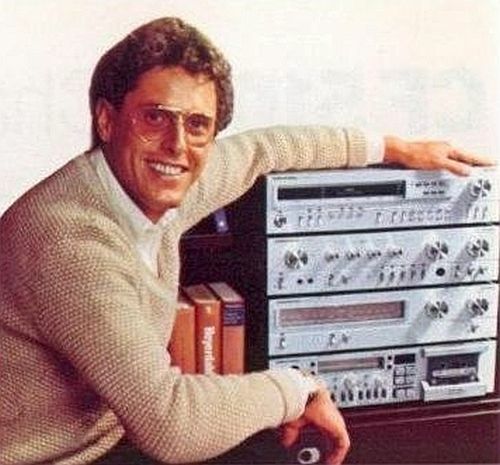 Positions 2 and 3 on the bias and EQ selectors are fixed for ferrichrome and high energy tapes, respectively. 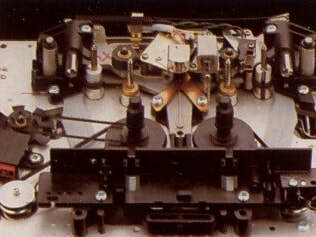 Position 1 is factory calibrated for CrO2 tape. 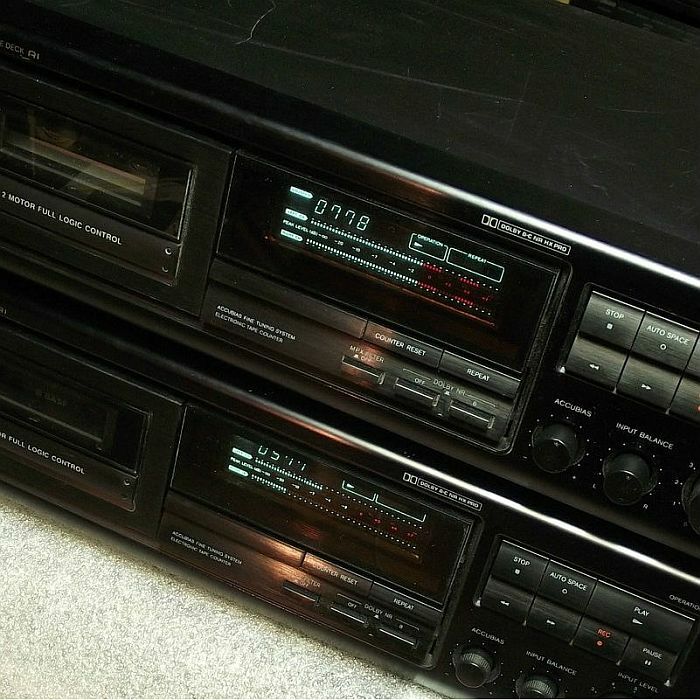 But it allows you to adjust the 860's record and reproduce electronics to get exact compatibility with any type tape you are using. 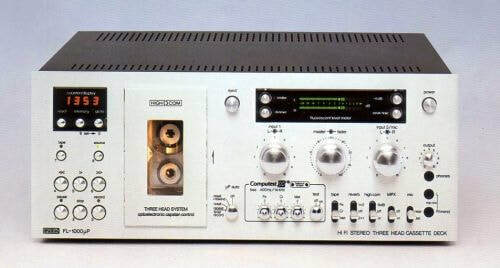 To optimize performance up to laboratory standards for any specific cassette you choose, there's a test jack where you can connect an external generator such as the TEAC TO-122. ​Technics designed the RS-9900US in two components for one reason: To outperform all other cassette decks. 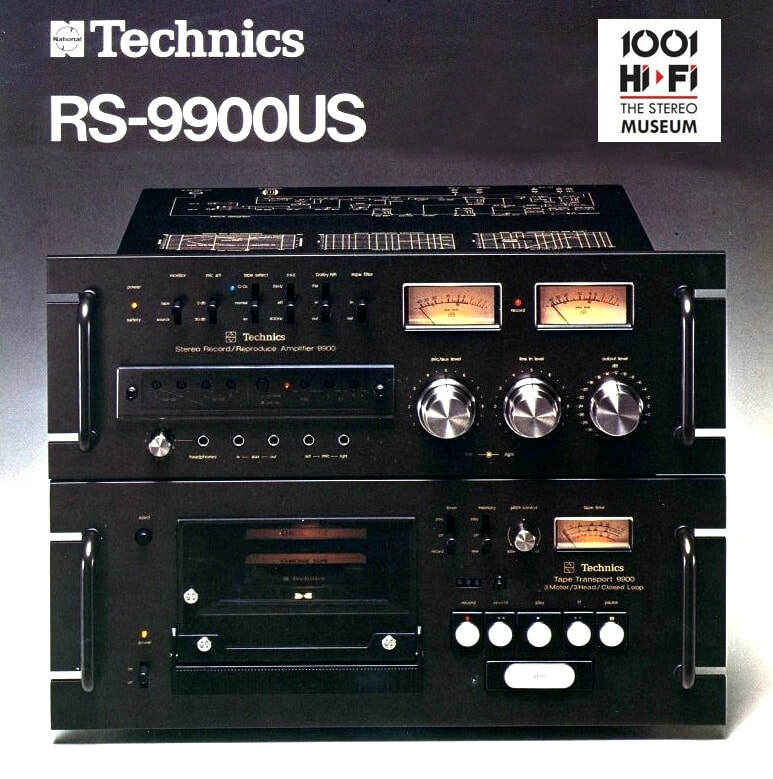 (said the advert) That's why, unlike other cassette decks, the Technics RS-9900US is a "cassette system". 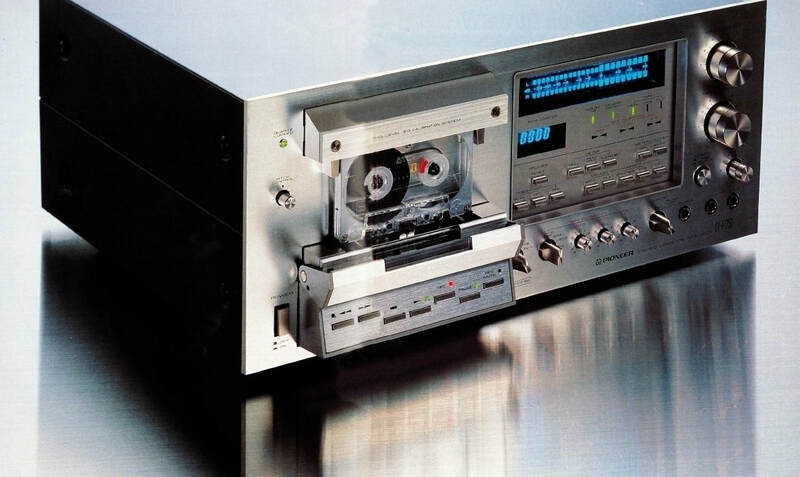 The world's first separation of a cassette deck into independent transport and amplifier units. 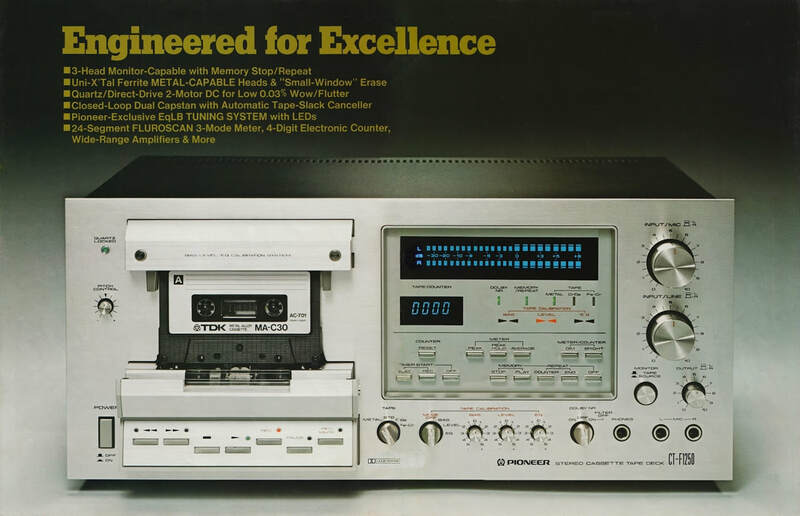 The result is cassette performance that truly epitomizes cassette technology. 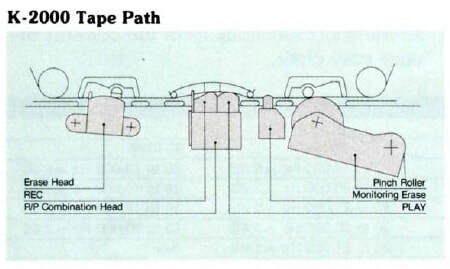 With features in the transport unit lika a closed loop, double-capstan, 3-motor drive. 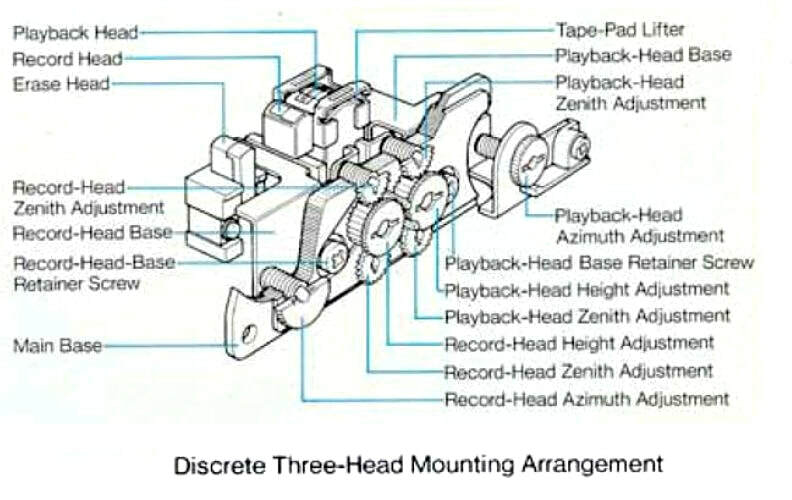 A 3-head system. Pitch control variable by 10%. And full IC logic control of all transport functions for absolute freedom and tape safety in switching modes. 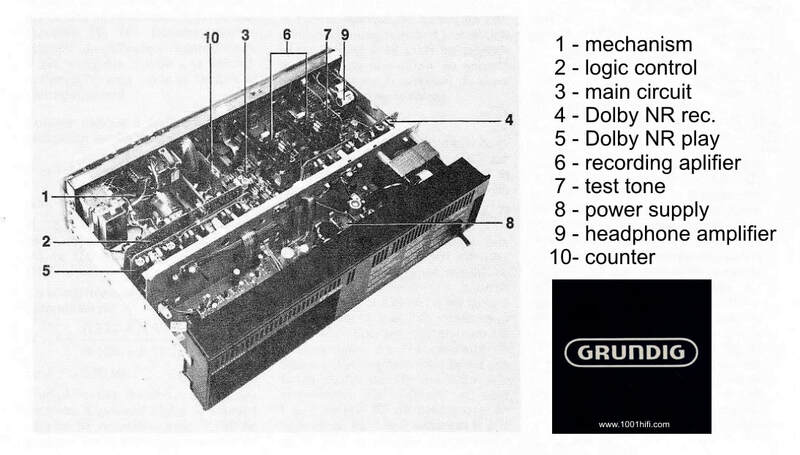 With circuit technology in the amplifier unit like a separate direct-coupled record amplifier. DC reproduce amplifier. Headphone amplifier. Four independent Dolby processors. Complete with separate calibration for record and playback. 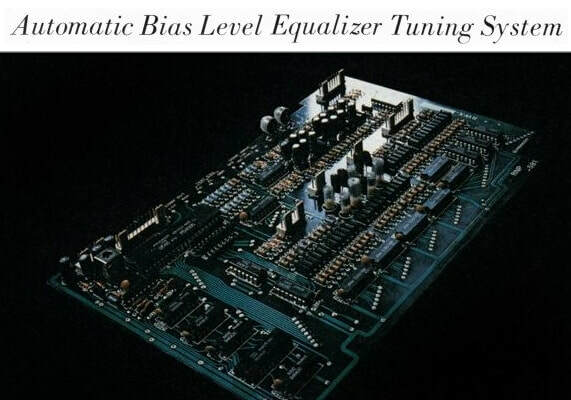 Continuously variable adjustment of bias and equalization. 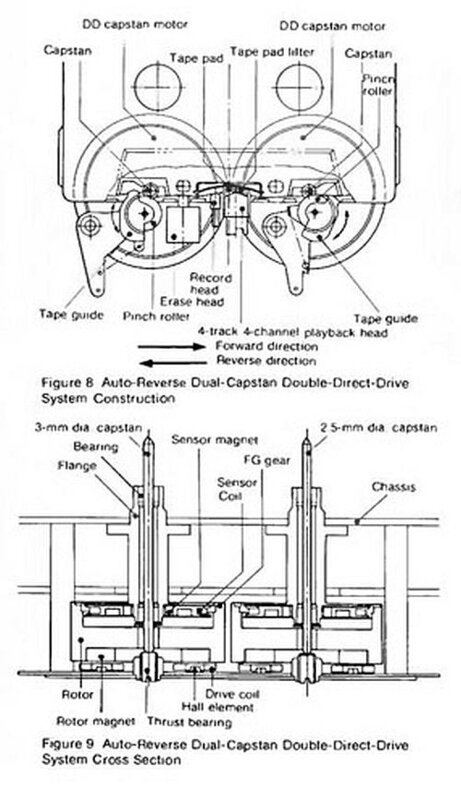 Head azimuth adjustment. And internal 400 Hz and 8 kHz test signals. 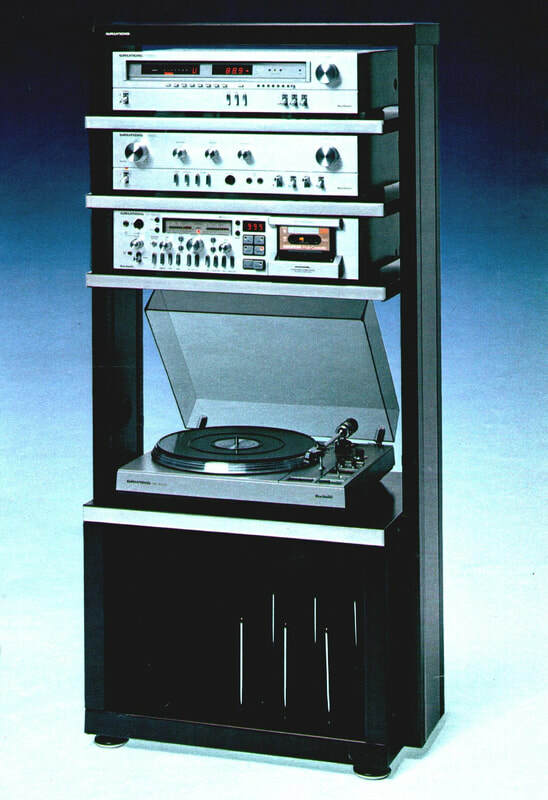 Track System: 4-track, 2-channel record and playback. 3 Motors: 1 direct-drive DC brushless capstan motor. 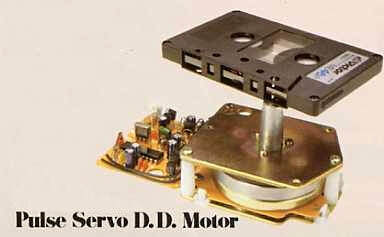 2 DC coreless motors for reel table drive. 3 Heads: 2 HPF heads for record/playback. 1 Ferrite head for erase. 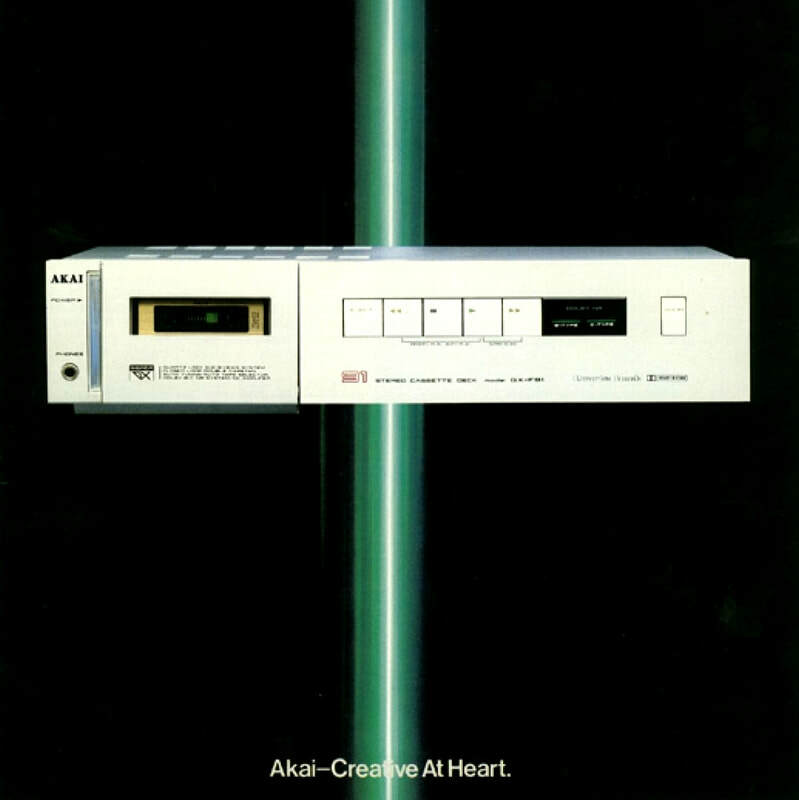 Frequency response (CrO2): 25-20,000 Hz (+/- 3 dB). Wow and Flutter: 0.04% WRMS. 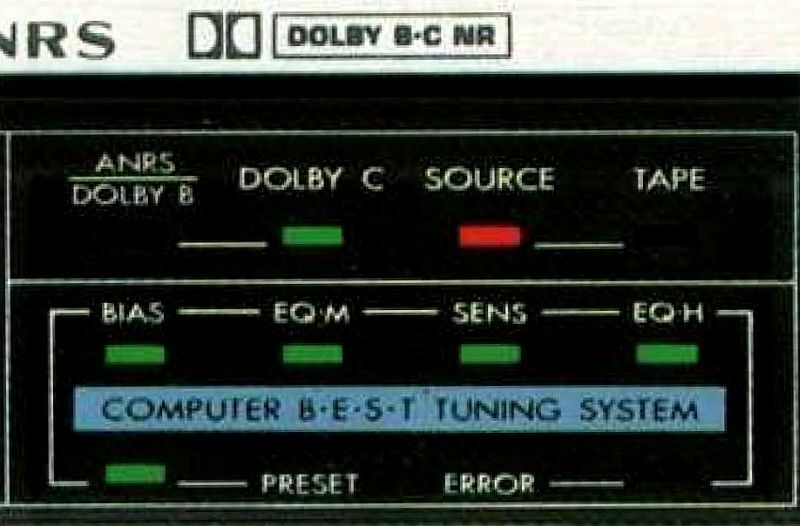 S/N ratio (dolby): 67 dB. Original retail price: $1,500. 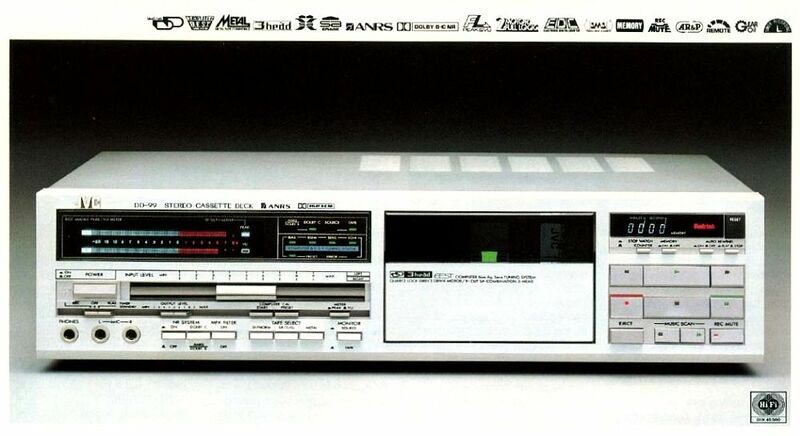 On the Japanese market this model was sold as Technics RS-690U. ​The RS-M95 was the last incarnation of the very successful series introduced with the RS-M85. 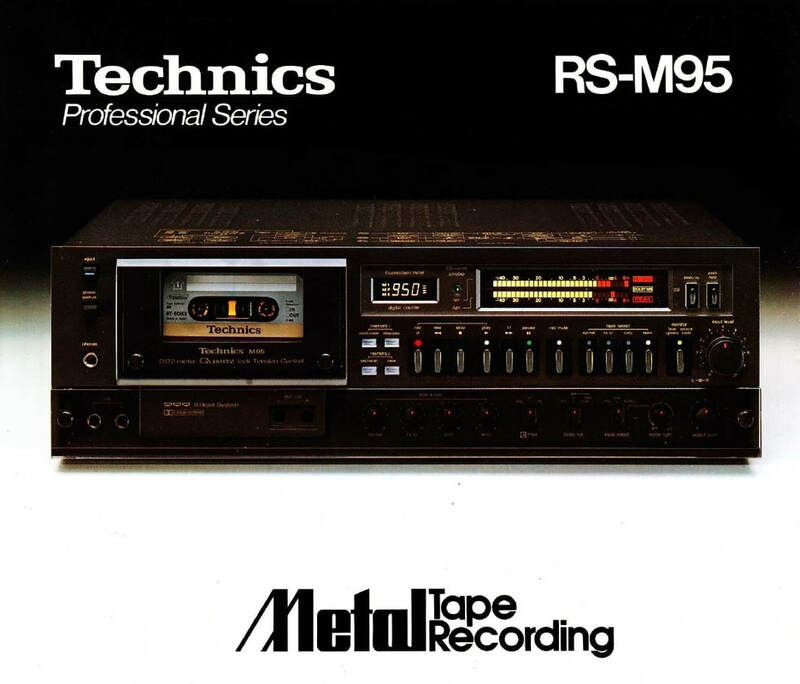 Technics has designed the RS-M95 with three heads, each designed for its special role in the recording and playback process. For low distortion. 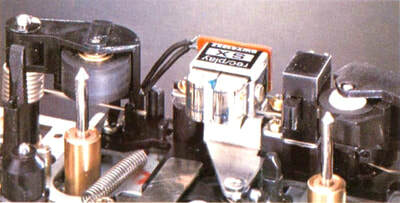 the recordinq head gap is set at a precise 5 micron. The playback head's tiny 1 micron gap provides a new level of high range frequency response. 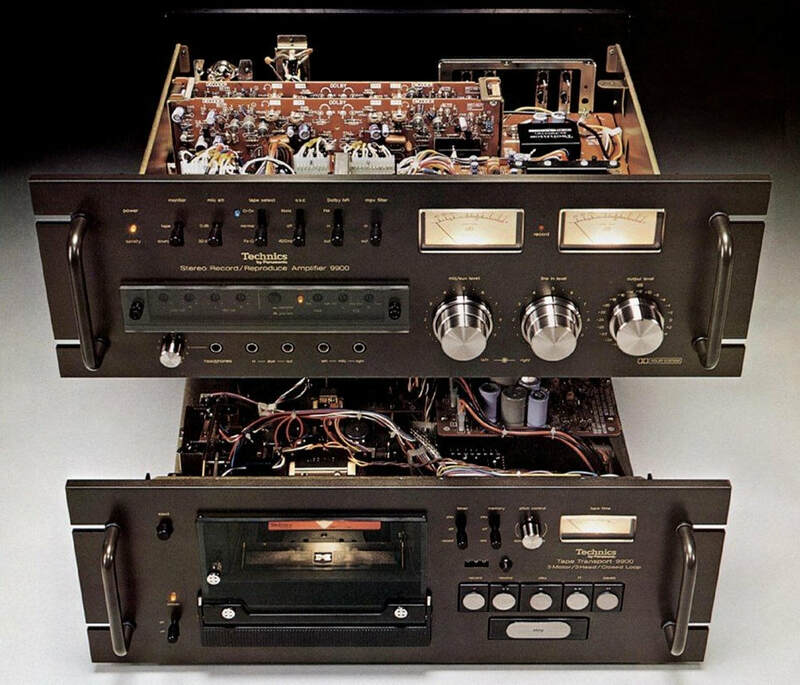 Both heads feature a special version of Technics' own HPF material for the gap and core to raise the saturation flux density to the heights needed for high input metal tape recording. 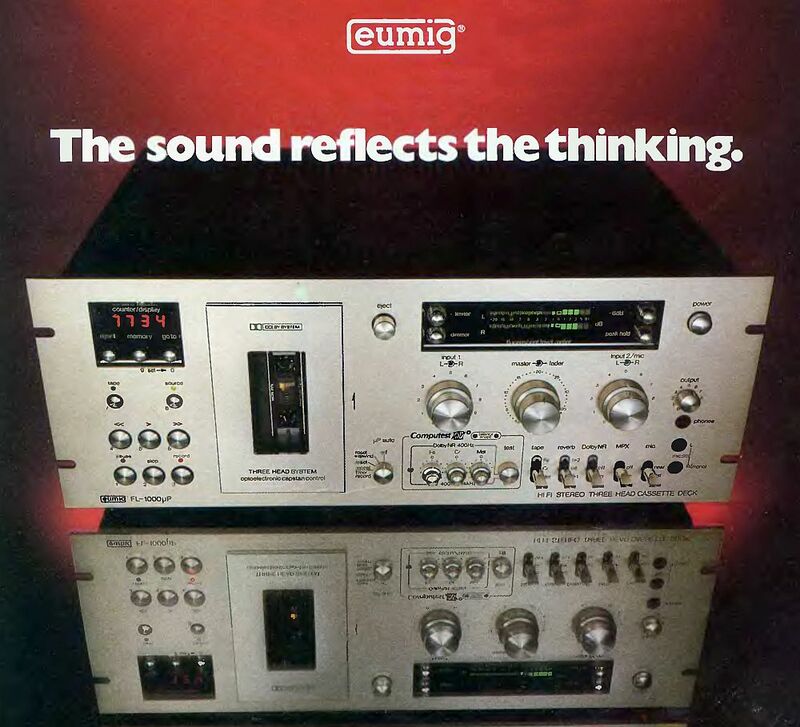 To bring out its full potential, metal tape needs about twice the recording bias current of normal tape, plus specialized (recording) equalization to deal with its high frequency characteristics. 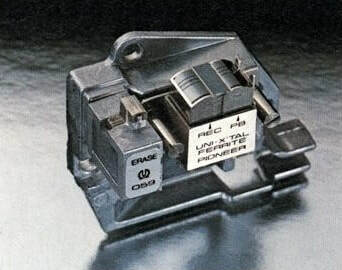 Therefore, the M95 not only has the conventional three positions on its tape selector, it also features a metal position especially for the new breed of metal particle tapes. 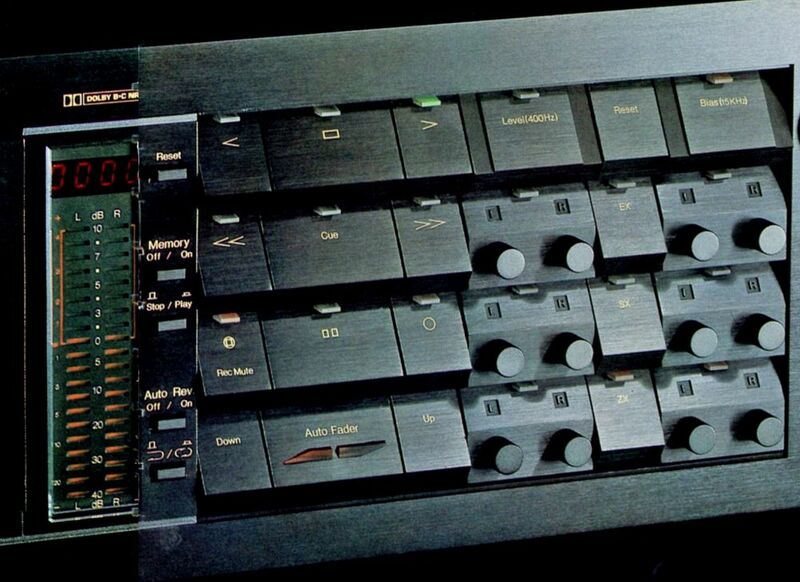 On top of this, you get added flexibility by using independent fine bias adjustment knobs for each tape type. These can be set for +/-20% of the conventional bias current to deal with each and every brand of tape. And the built-in oscillator provides 400Hz/8kHz test-tone signals for use in this calibration. ​Technics has led the field in employing new FL meters as a more accurate and convenient alternative to needle type meters. 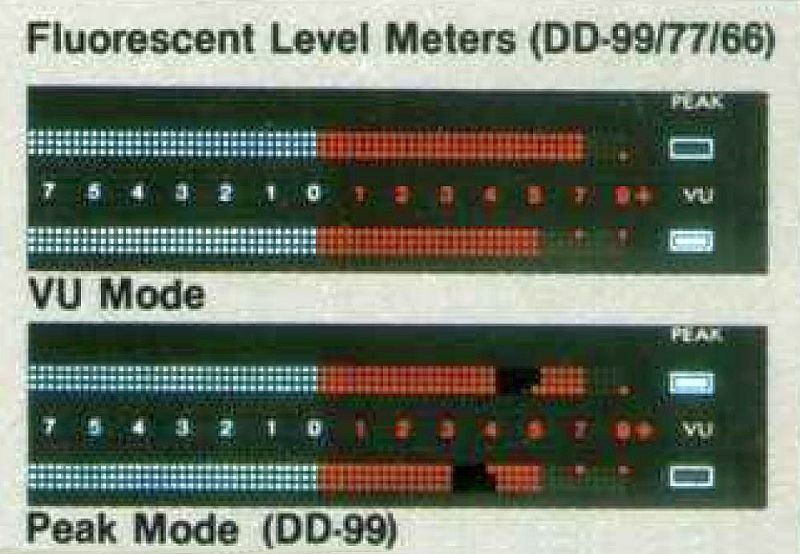 Now in the M95 a newly developed professional quality FL meter with an extended indication range of -42dB ~ +8dB (30 segments: -6dB ~ +4dB are in 1dB steps; each of the other segments cover 2dB steps; for easier legibility, 0dB and above is a brighter red) is used. ​Timer start selector, record muting switch and feather-touch controls adds to the list of functions of this Professional Series deck while EIA rack mounting makes this deck a perfect match for the Professional 10000 Series audio components. 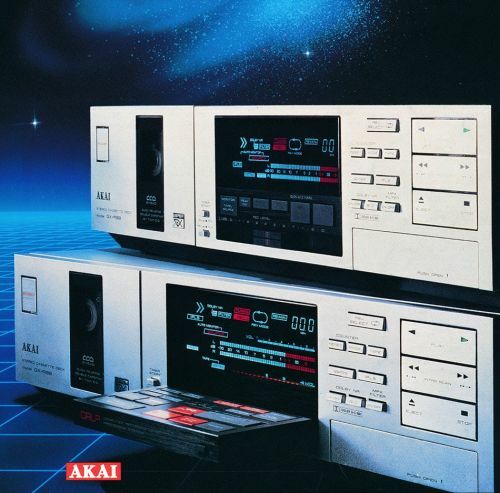 ​AKAI GX-R99 and GX-R88. 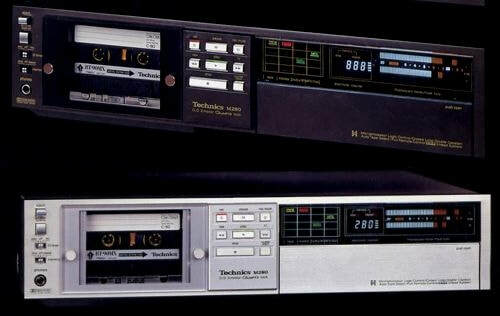 Two Super Machines that redifine the state of the recording art. 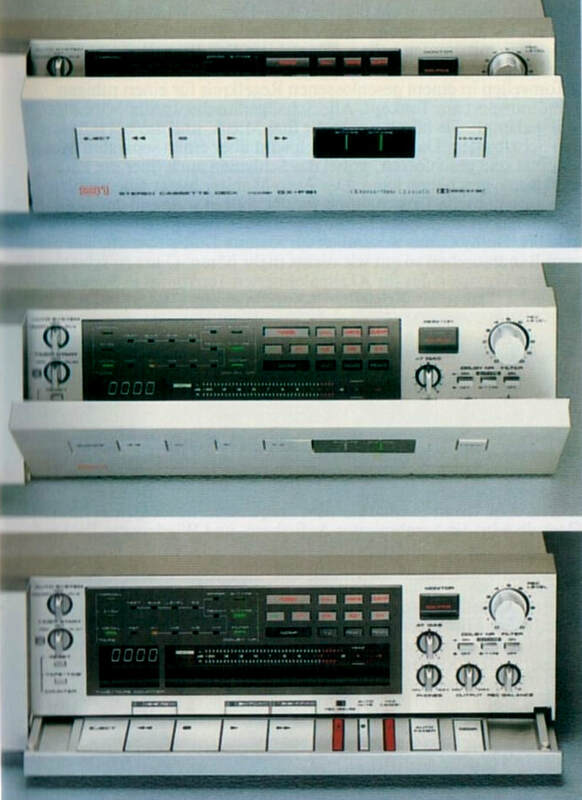 Four features mark these decks as significantly new and different (in 1985): (1) Super GX 3-Head Quick Reverse; (2) Closed Loop Double Capstan by Twin Direct Drive; (3) CRLP (Computer Recording Level Processing - GX-R99 only); and (4) High Tuned DC Amplifier Circuitry. 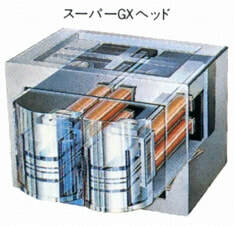 Akai's unique Super GX head (Rotary 3-Head design) is made of crystal ferrite in extra hard, mirror polished glass. The superiority of the Super GX head is overwhelming in the critical high frequencies, the playback output level being as much as 7.8dB better than sendust at 10kHz. The finish is so smooth that practically no friction noise is generated and dust particles cannot easily adhere. Both the GX-R99 and GX-R88 are three-head decks with separate Super GX heads using a 4-micron gap for high levl recording and a 1-micron gap for high frequency playback performance. 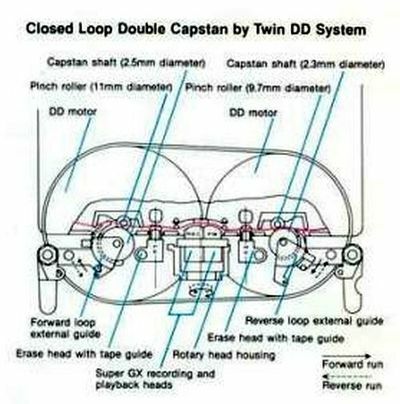 The double capstan system is driven by one DD motor for forward, and another DD motor for reverse tape transport. 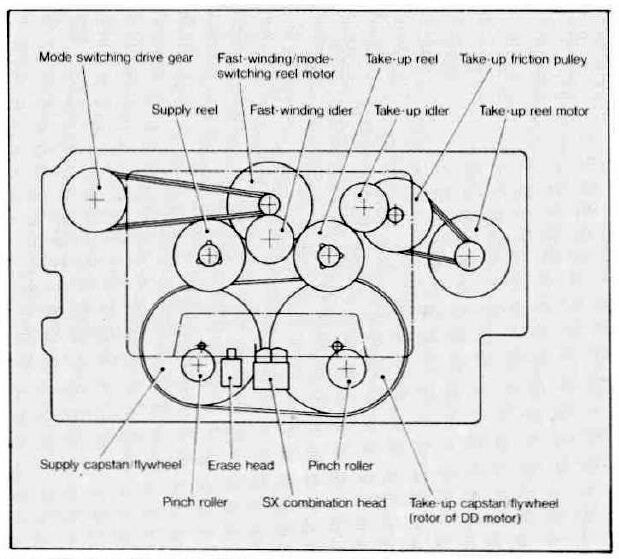 Each DD motor has a heavy flywheel to smooth irregularities. Brushless, corelss and slotless FG servo motor construction assures excellent speed accuracy. 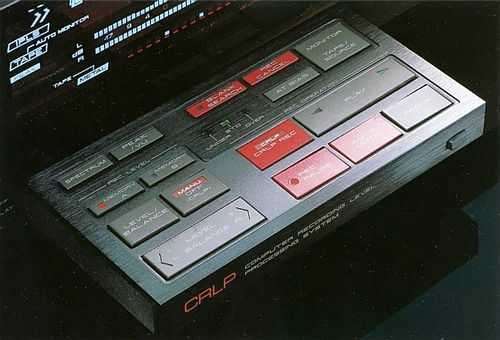 CRLP (Computer Recording Level Processing - GX-R99 only) handles everything that contributes to the sound quality of a recorded tape. 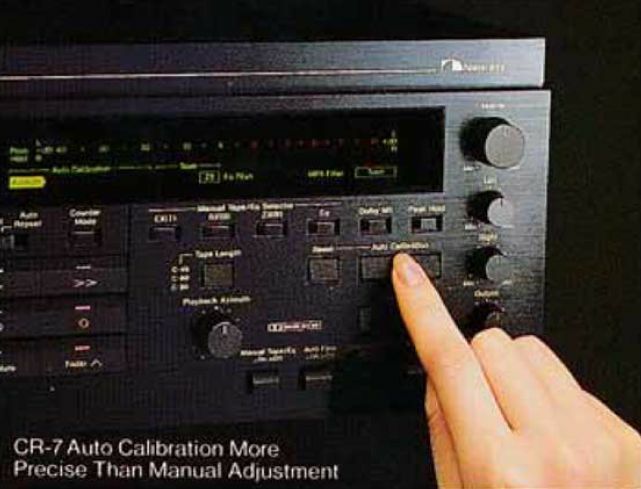 First "Quick Auto Tuning" sets the optimum bias and recording equalization for the tape to be used. Second it detects MOL (maximum output level). Third it analyzes the energy spectrum of the input signal, compares it with MOL and sets recording level to bring out the tape's full potential while avoiding overload distortion. 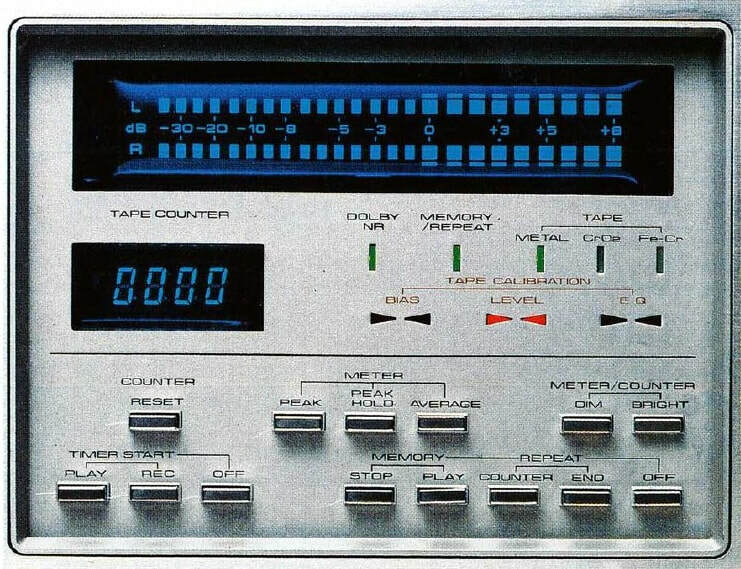 Akai's 3-way 2-color 24-segment fluorescent (FL) display indicates recording level in VU and peak modes, it shows the enrgy spectrum of the music signal, and it includes a 3-way 4-digit electronic tape counter (elapsed time, remaining time, and normal tape counter), auto monitor position, IPLS operation, Dolby NR, MPX filter, reverse mode, and more. ​No knobs. No keys. And no clutter. 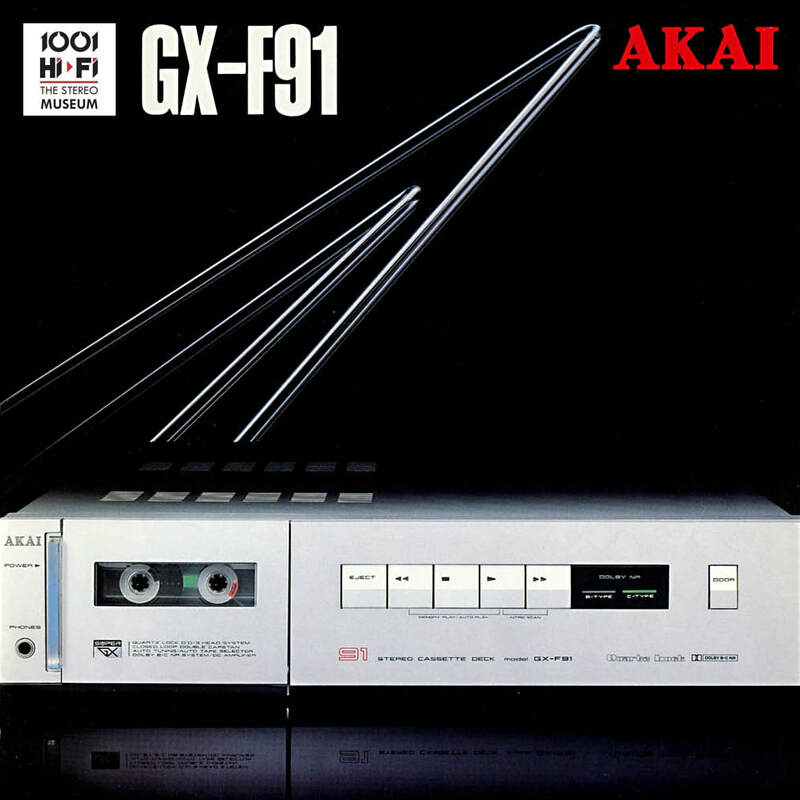 AKAI GX-F91, a polite presetation of just the basics. But press the "door" button and, almost by magic, the faceplate automatically lowers (motor powered) to reveal the main control panel. 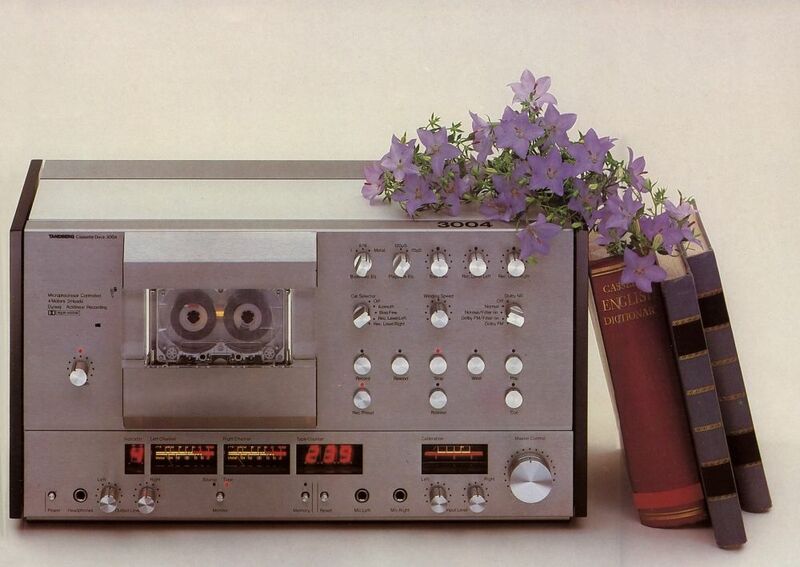 Now, insert a cassette. Two microcumputers take charge, first automatically setting the bias. 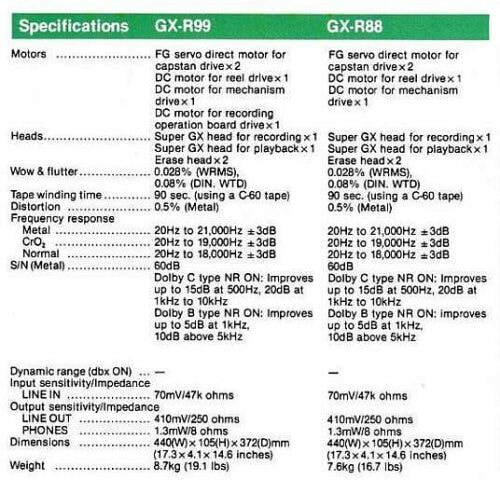 Then, executing a 64-step "tape-tuning" analysis that makes sure the GX-F91 gets the maximum from any tape. 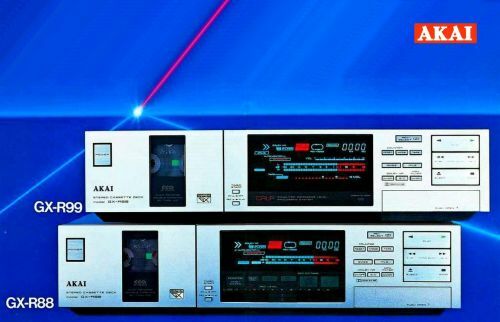 For superior frequency response and dynamic range, the GX-F91 is also endowed with a 3-head design, AKAI Super GX Heads and Dolby B & C systems. Plus operational features like auto-fade, auto-mute and auto-record-cancel that virtually guarantee professional quality recordings. AKAI's original Auto Monitor system is a "Can't Miss" feature that automatically goes into source monitoring during REC standby and into off-the-tape monitoring during REC, to eliminate monitor switch errors. 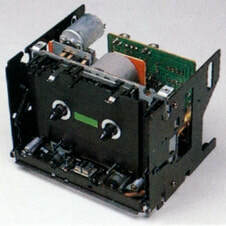 Tape drive has been given added precision with Quartz-lock PLL servo DD motor, adding stability and accuracy so essential to tape travel.The Q&Q (Quick & Quiet) mechanism incorporated into the GX-F91/71/51/31 models provides direct lead-in and power eject for easier operation + ....Many More Akai Features. 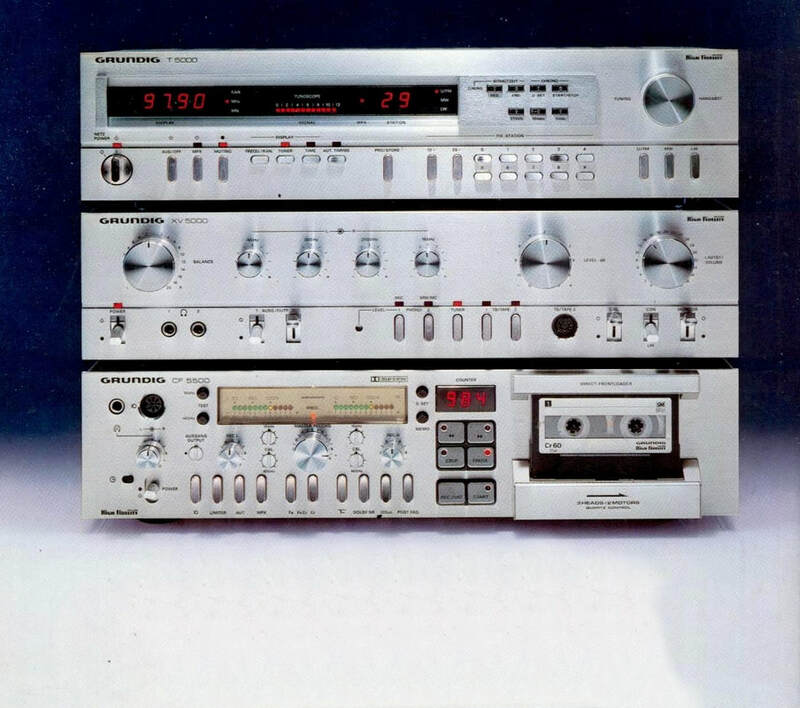 ​This was the first 3 head cassette deck from Germany's largest consumer electronic manufacturer, GRUNDIG, and the second cassette deck "Made in Germany" with 3-head design, after the Thorens PC 650. 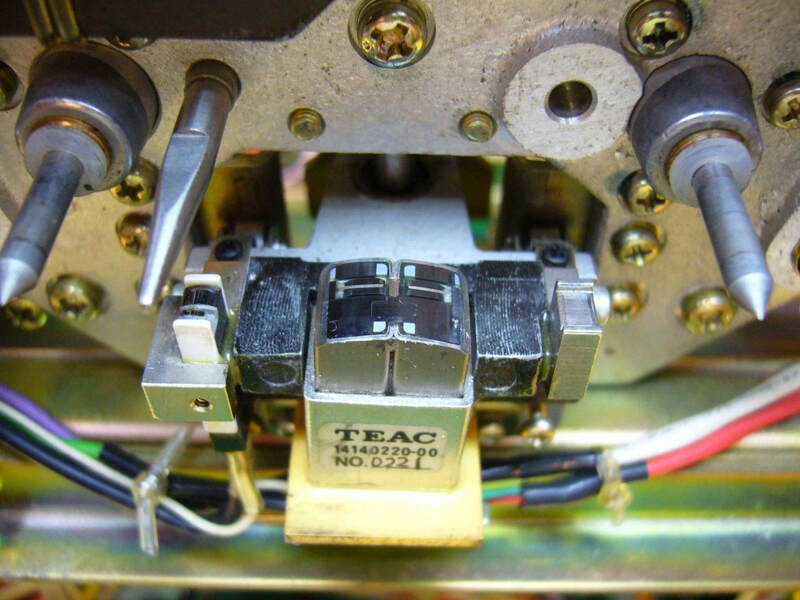 It's a complex machine built around a 2 motor mechanism with one Quartz controlled capstan and 3 Ferrite heads. 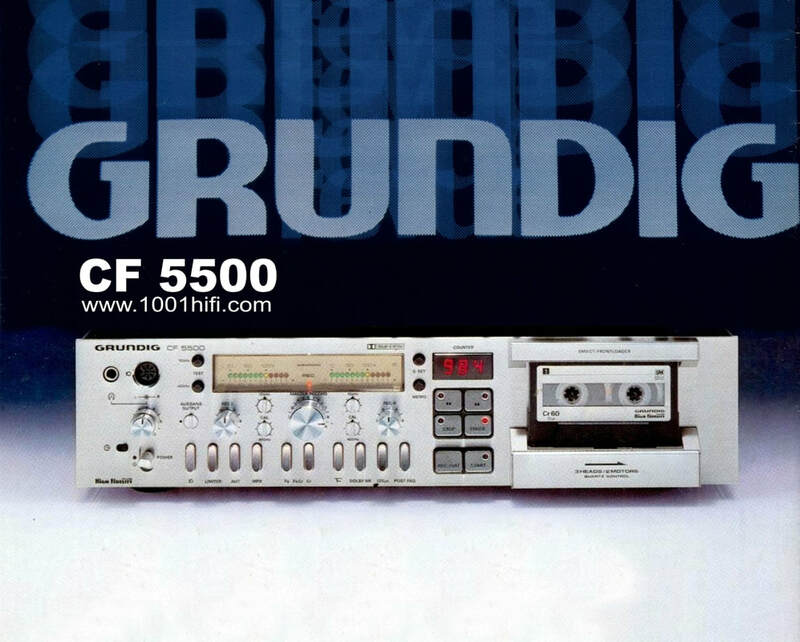 For best results with any tape the GRUNDIG CF 5500 is equipped with two test tones (10kHZ, 40Hz) with separate adjustments for left and right channel. 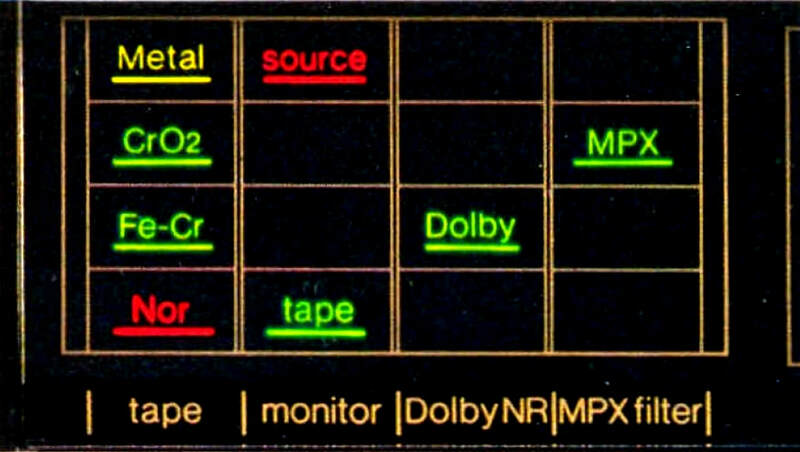 Dolby circuits are also double (recording and playback). The CF 5500 can handle Normal, FeCr and CrO2 tapes. There is separate output level control and a dedicated headphone amplifier with left and right channel level adjustments. 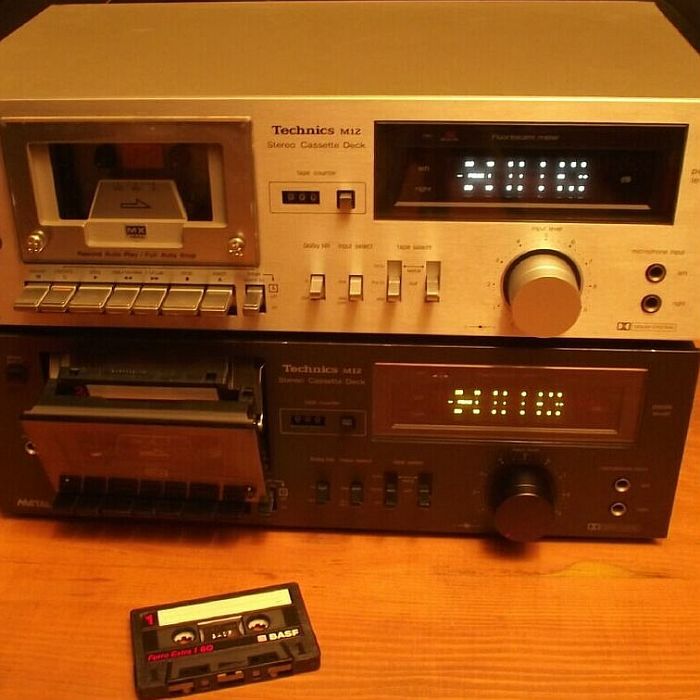 The cassette compartiment is open type with full logic controlled mechanism, digital tape counter and LED recording level meters. 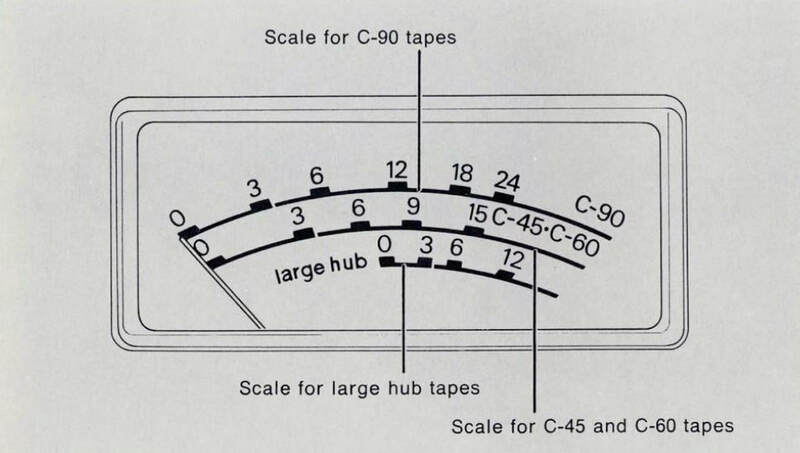 The new Metal tape formulation was still relatively new on the market so there was a parallel model, called CF 5500-2, that could handle Fe-Cr, CrO2 and Metal tapes. They were both avalable with silver or brown front panel. 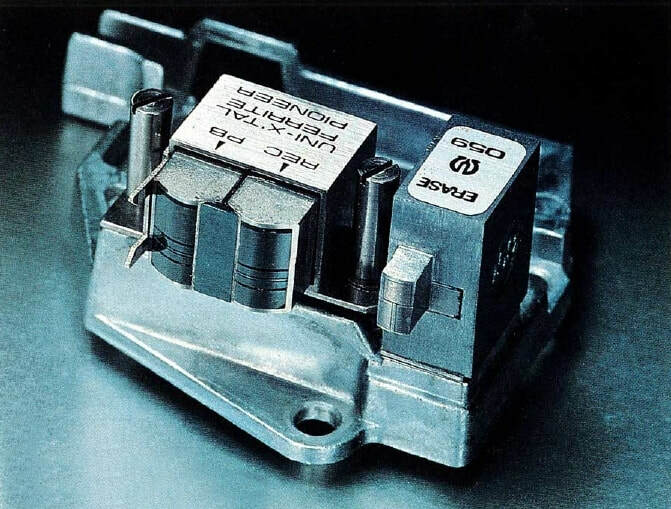 The only distinctive visual difference between the CF 5500 and CF 5500-2 was the square LED row on the CF 5500-2 opposed to the round LED's used by the CF 5500. 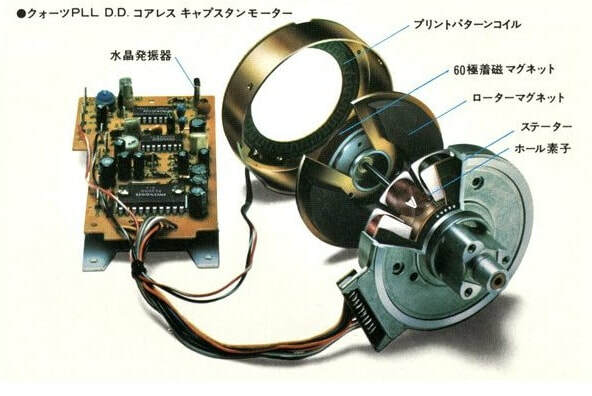 When introduced in 1982 the JVC (Victor in Japan) DD-99 promised open reel sound quality with cassette convenience. 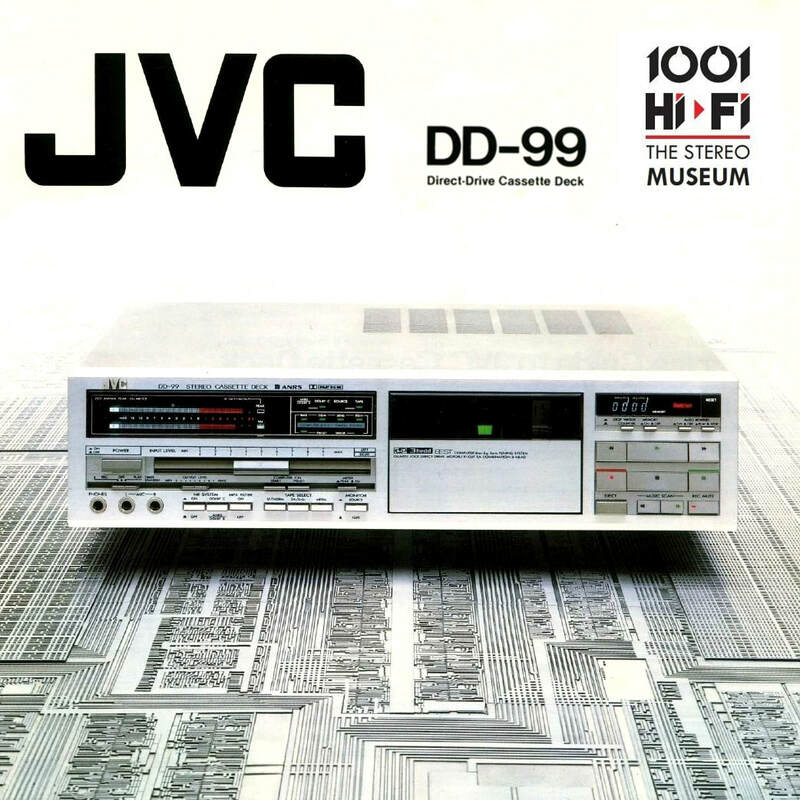 To achieve this the DD-99 combines such high-technology JVC innovations as a Quartz-Lock, direct-drive Pulse Servo Motor with two new twists: a Double Servo and Multiplied Bridge Drive. 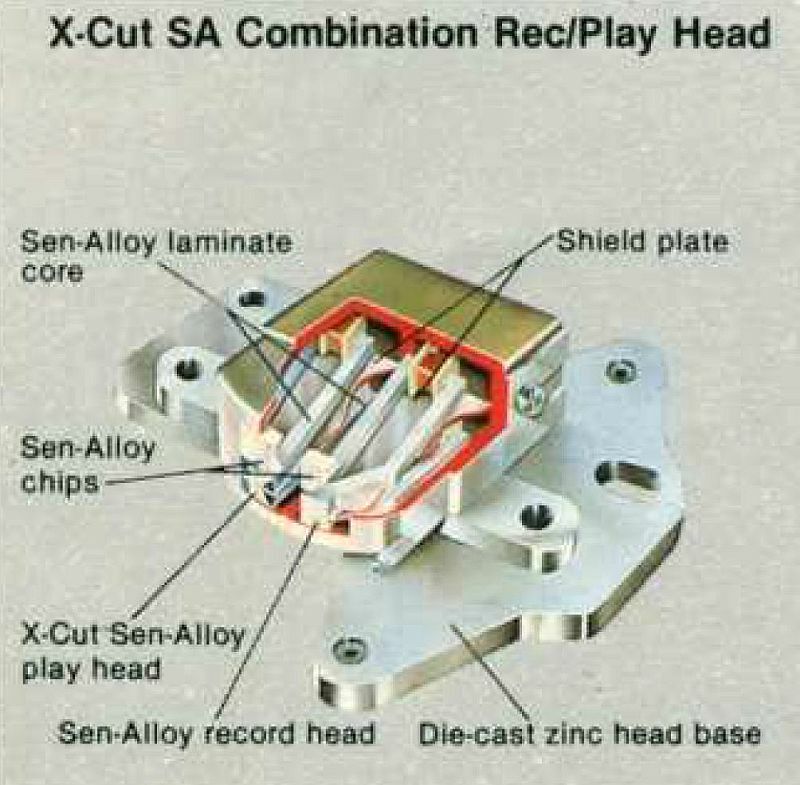 Add them to a three-head design using an X-cut SA combination Rec/Play head and the B.E.S.T. 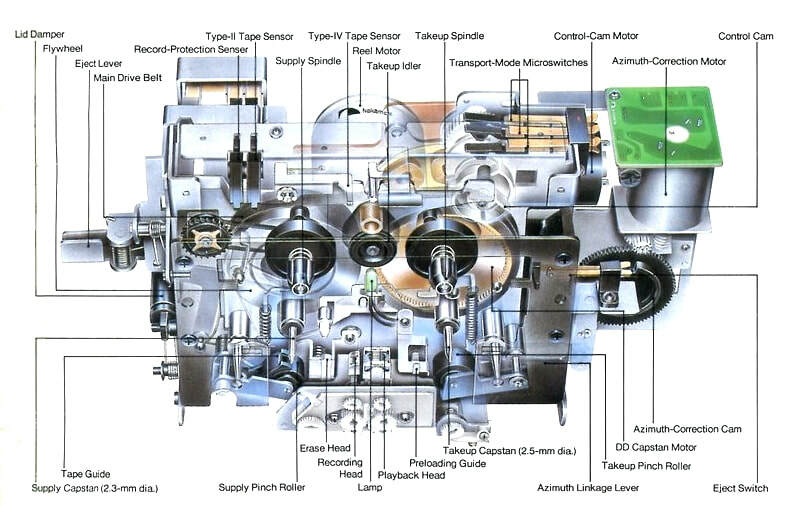 tuning system, and you get peerless performance. 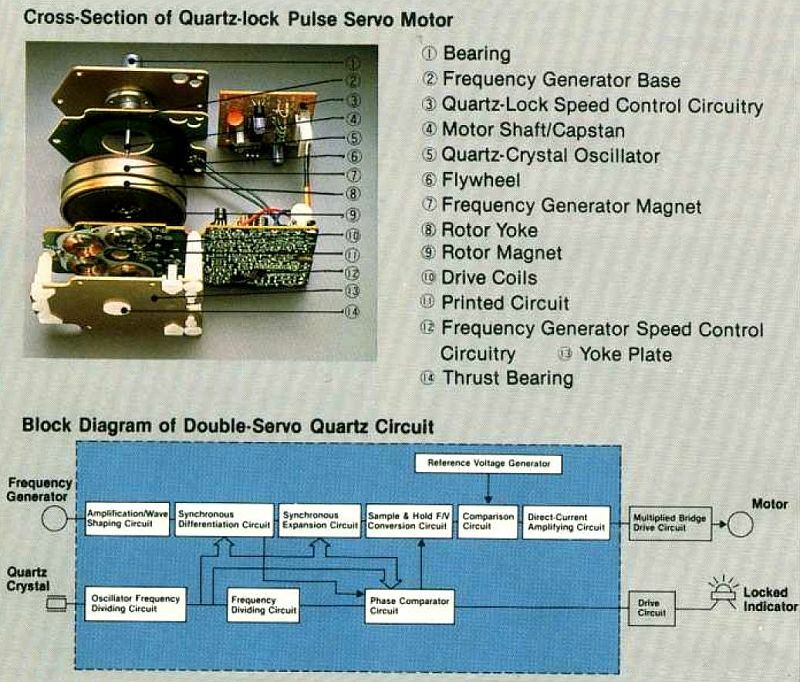 The Quartz-Lock, direct-drive Pulse Servo Motor improves speed accuracy. 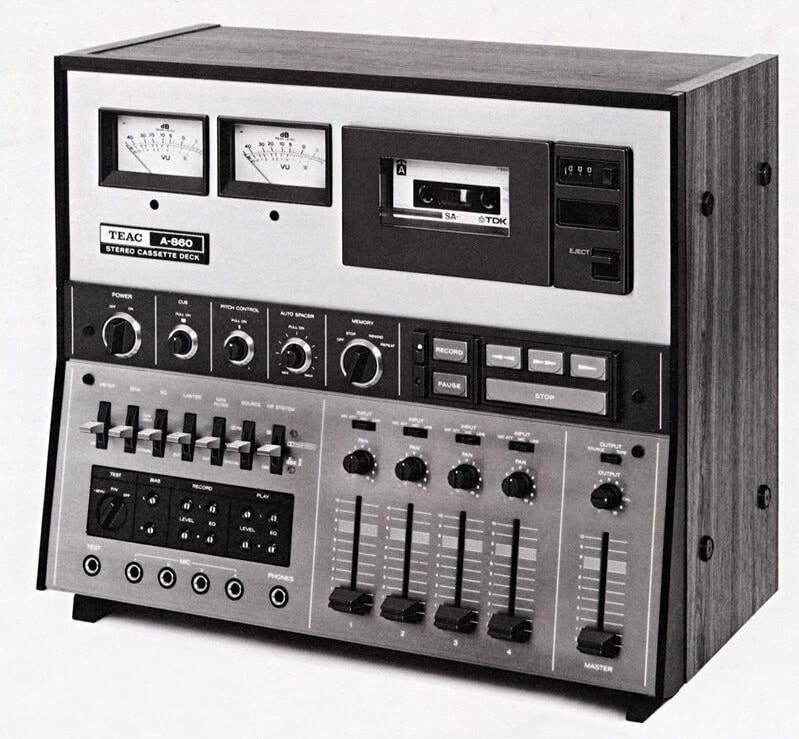 Using a low-rpm direct-drive motor, the highly accurate tape transport of the DD-99 is simplicity itself. The coreless design completely eliminates jerky motion called "cogging" while speed accuracy is provided by means of a quartz-referred Double-Servo circuit, together with new "Multiplied Bridge Drive". The B.E.S.T. 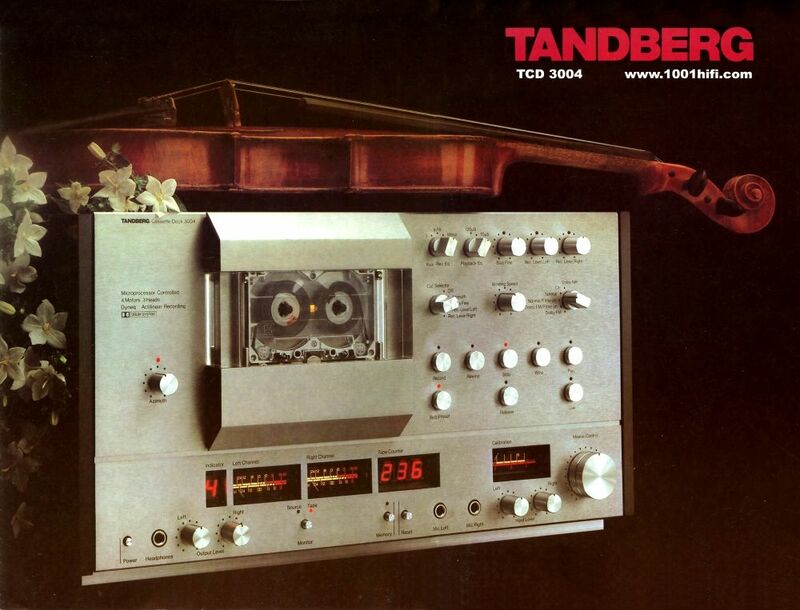 tuning system automatically compensates for any differences in Bias, Equalization and Sensitivity for flat response (from 40 to 12,500Hz +/-1dB) from any tape. It's done by means of a built-in computer and takes only about 30 seconds. 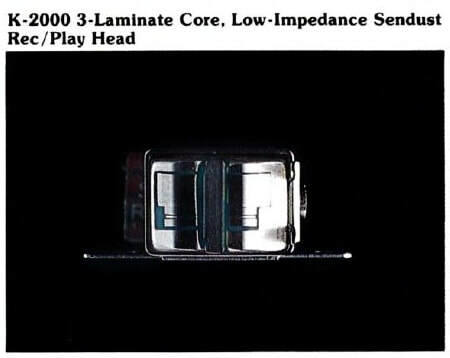 Three heads - JVC's exclusive X-cut SA combination Rec/Play head (two heads in one housing), and two-gap SA Erase head - provide two very important benefits. One, it allows you to monitor your recordings as they're being made, and two, it means every head is provided with an optimum gap width - no compromises. The clearly discernible X-shaped core of the playback head eliminates the so-called contour effect, assuring smoother overall response. The two motor full-logic control tape transport features a tension stabilizing loop. The supply reel is connected to the takeup reel by means of a belt which supplies the proper hold-back tension throughout play or recording. 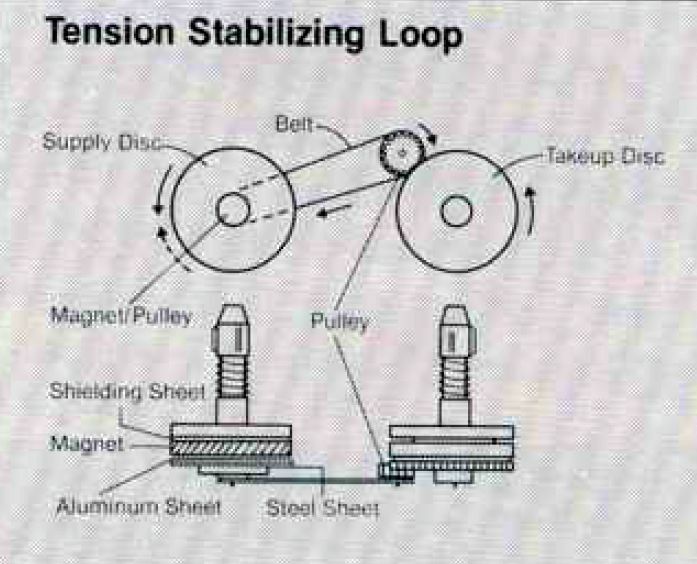 It's an electrical system, no mechanical friction is emplyed to create tension. Therefore, tension is always uniform, and stability will not deteriorate with the passage of time. ​Nakamichi was at the vanguard of high-class cassette decks, providing the highest possible performance quality from every cassette while at the same time simplifying deck operation to make that performance available to everyone. 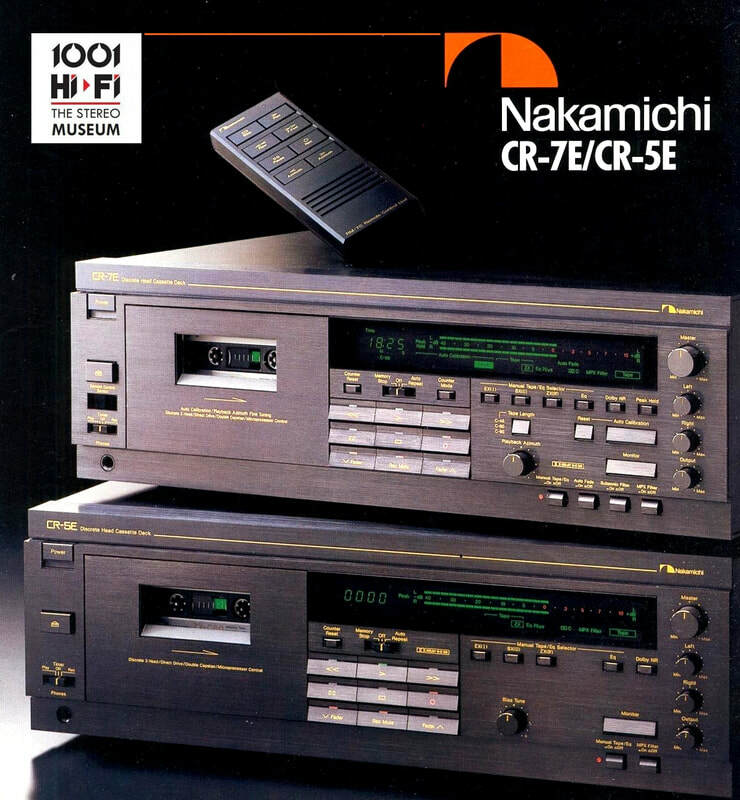 The Nakamichi CR-7 and CR-5 Discrete-Head Cassette Decks embody both the vital aspects of this trend, offering fully discrete three-head designs, direct-drive closed-loop dual-capstan transports, low-distortion/low noise amplifiers and a host of other features. 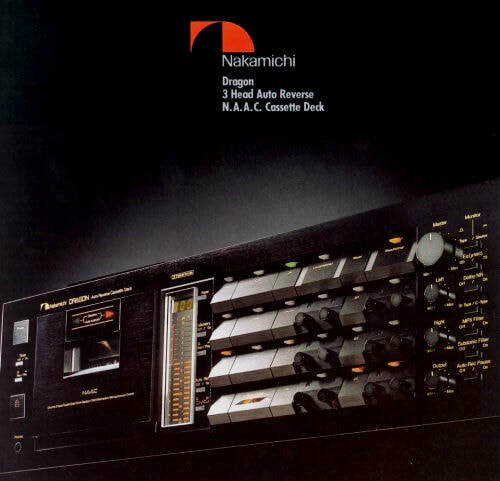 The Nakamichi CR-7 features the unique Nakamichi Auto Calibration System and the Playback-Head Azimuth Fine Tuning Control. 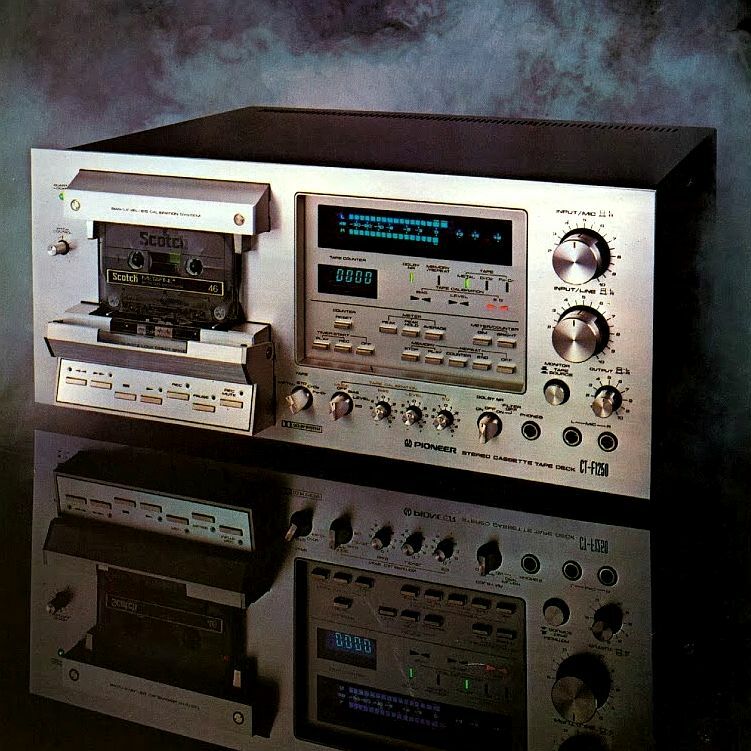 While both decks offer superb value and can easily be integrated with the components of even the finest audio system in any home, they have been specifically designed to match the Nakamichi Home Audio Electronics Systems "7" and "5", for outstanding performance with the added convenience of total System Remote Control. 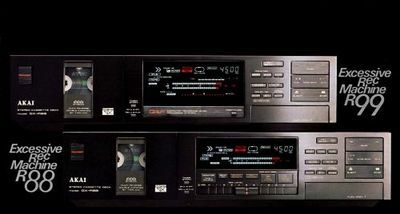 Other features included are:real-time tape counter for C-90/60/46 tape - even if the tape is not fully wound to its begining when mounted, Dual-Speed Master Fader Control with Auto Fade function (tape end auto fade out), Wireless Remote Control (CR-7), Output Level Control, Headphone Terminal. These cassette deck were built between 1986-1993 in three versions CR-70/CR-7A/CR-7E. 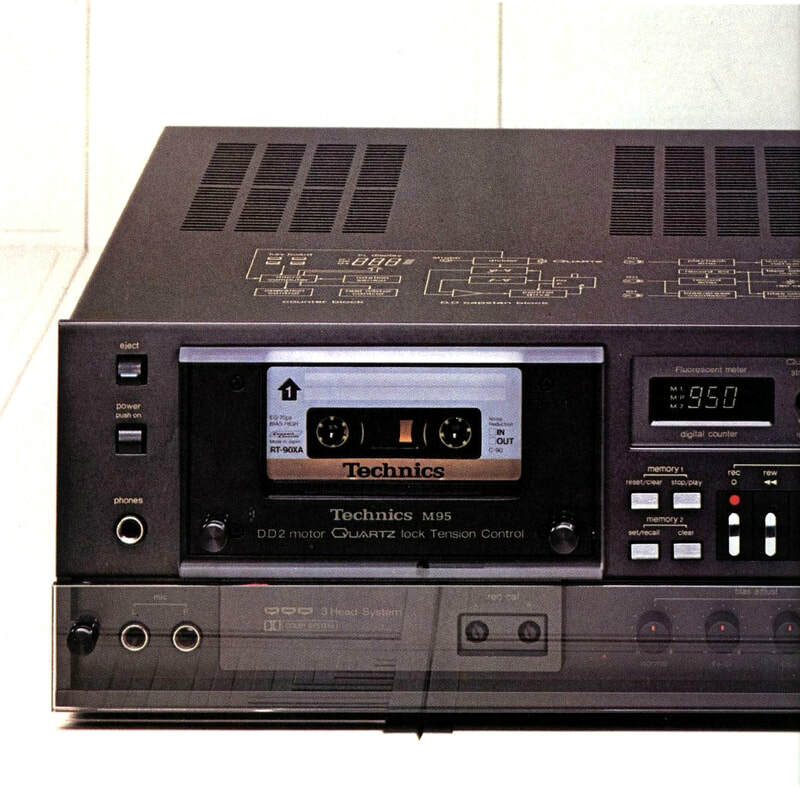 ​The Ultimate Expression of Cassette Deck Technology...Technics RS-M280. 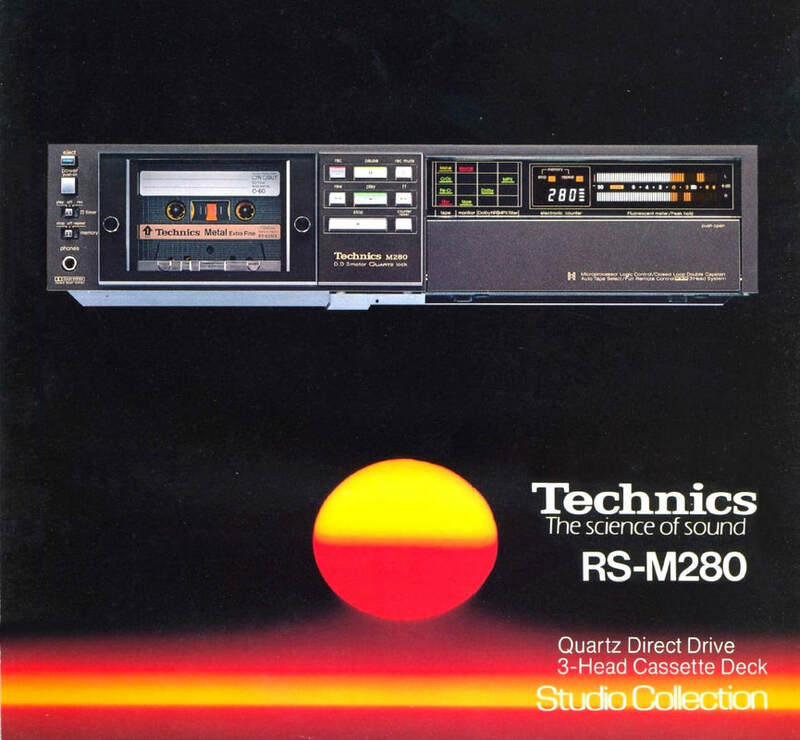 The RS-M280's innovative 3-motor transport system begins with the famous Technics planar-opposed direct drive motor. This brushless, coreless, slotless DC motor is renowned for accuracy, durability and compact size. 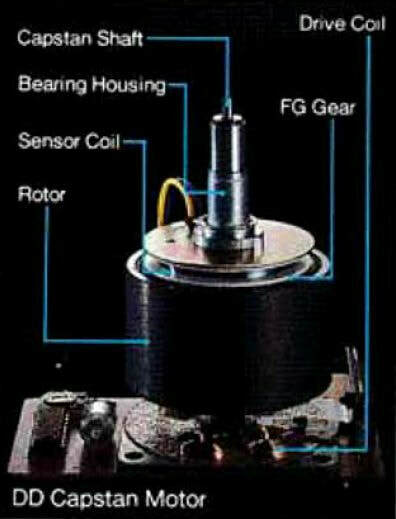 Using a quartz oscillator as reference, the motor's integral FG mechanism is capable of extremely precise speed control. The result? The lowest wow and flutter ever achieved in (1981) a Technics cassette deck - a mere 0.024% (WRMS) This Direct Drive motor is the take-up capstan while the supply capstan is belt drive. For the RS-M280, Technics has constructed the take-up capstan to be slightly wider than the supply capstan - this difference is then compensated for by a corresponding difference in flywheel size. 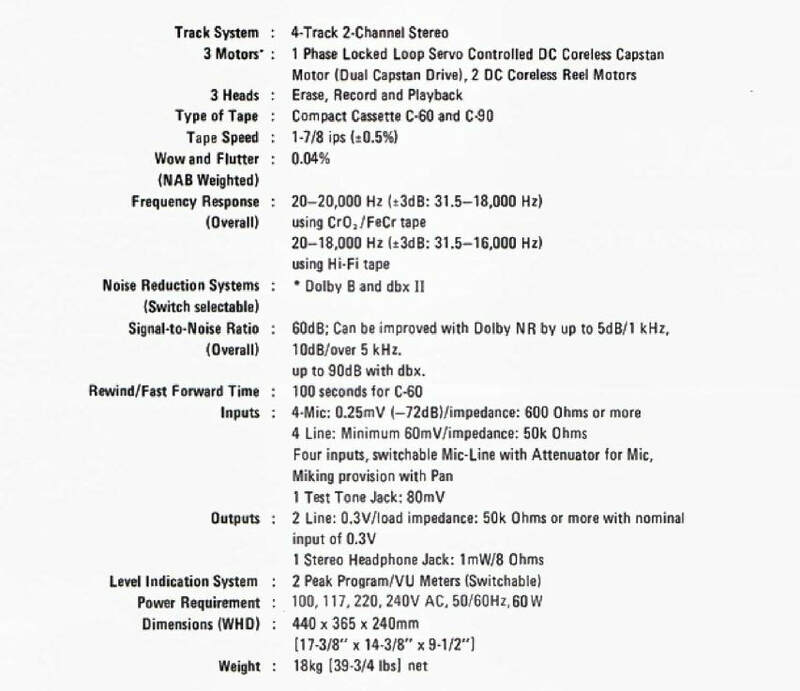 In conclusion with this system speed control is consistently accurate, and modulation noise is insignificant. 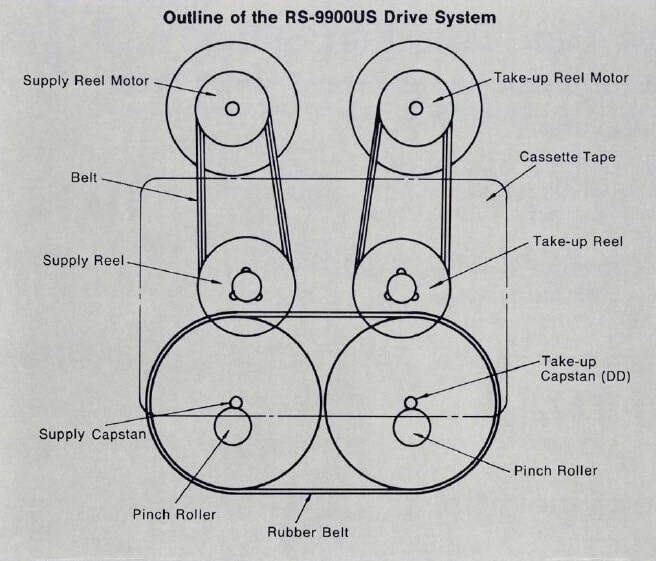 The 3-Motor System of the RS-M280 uses a different approach for motor tasks. 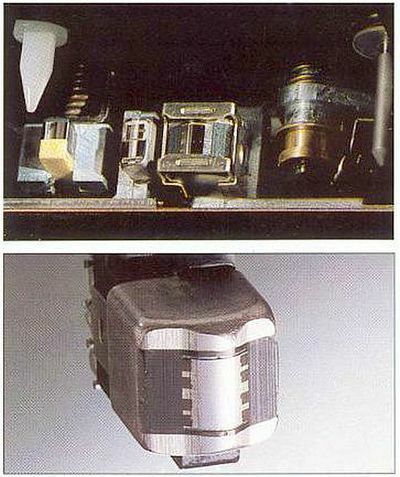 There is one motor for high-speed winding (fast forward and rewind) and another motor solely for driving the take-up reel during playback (or recording) while the Direct Drive motor is used for the take-up capstan. 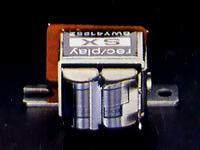 For the 3-Head Configuration Technics uses SX type (Sendust Extra) heads. 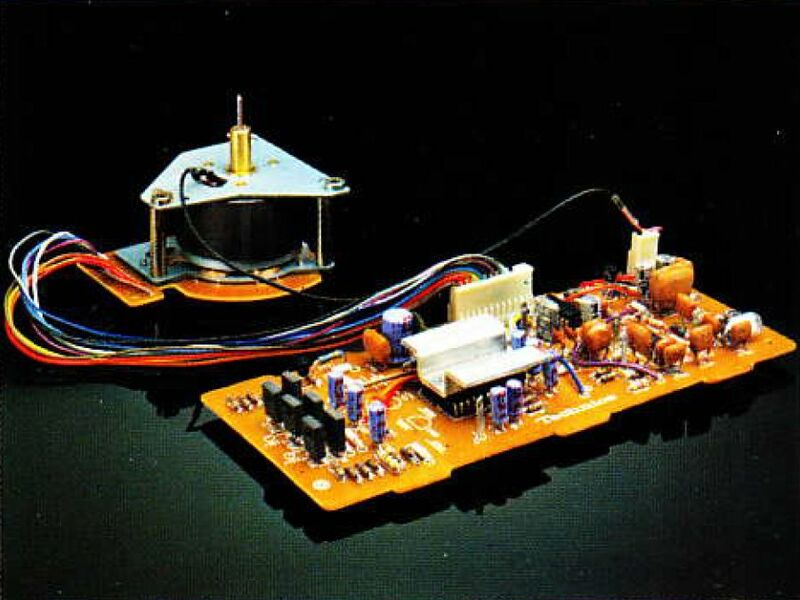 It is manufactured by a special method that minimizes eddy currents to optimize high frequency response. 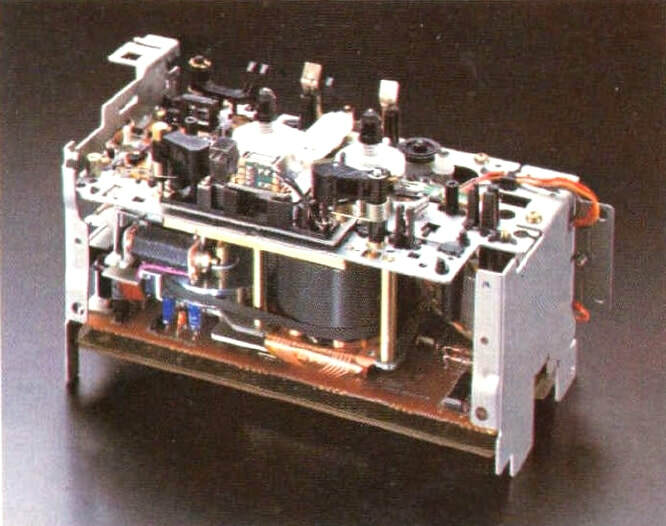 SX exhibits the very high saturation flux density needed for metal tape recording. But it also provides superb response with all other tape formulations. With the RS-M280, it's easy to make the appropiate bias adjustment. 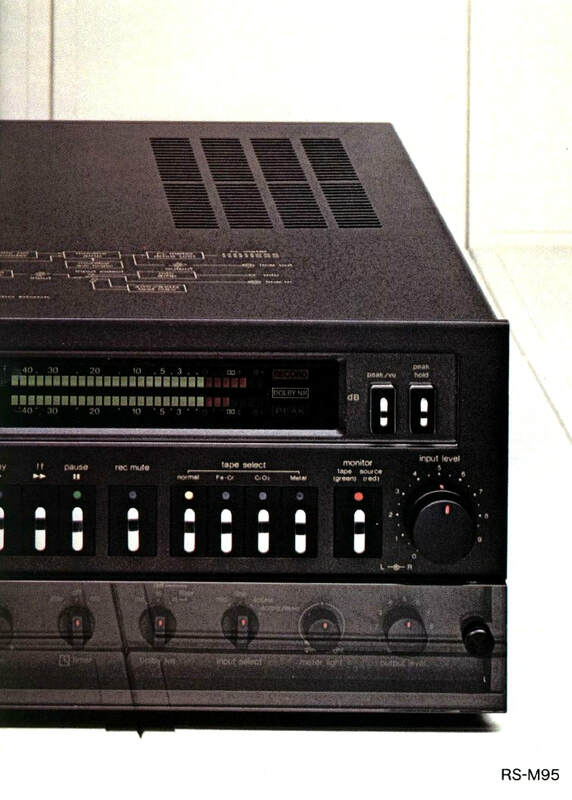 To test tape response, the RS-M280 is equipped with a test-tone oscillator providing 400 Hz and 8 kHz frequencies. 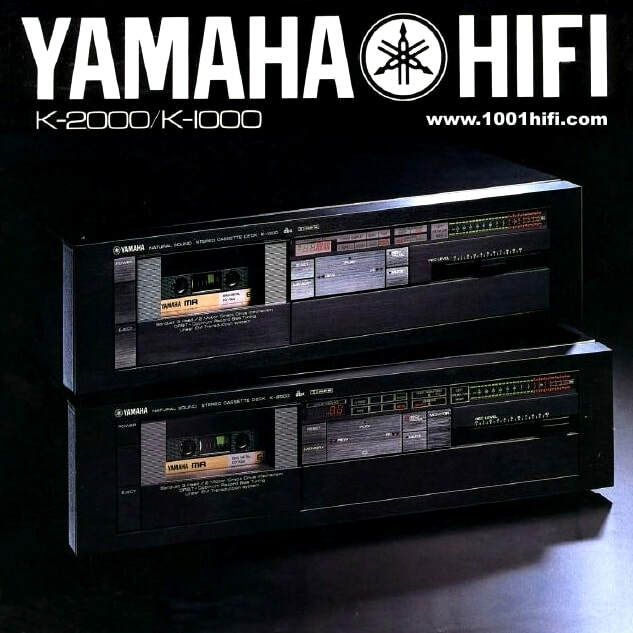 ​The K-2000 and K-1000 Natural Sound Cassette decks from Yamaha were introduced in 1982. They are thoroughly eqipped with uncomprimising technology, a combination of "spare-no-cost" engineering and innovative design. Both these decks are highly automated - thanks to built-in computers - providing an extensive range of features that are simple to use. 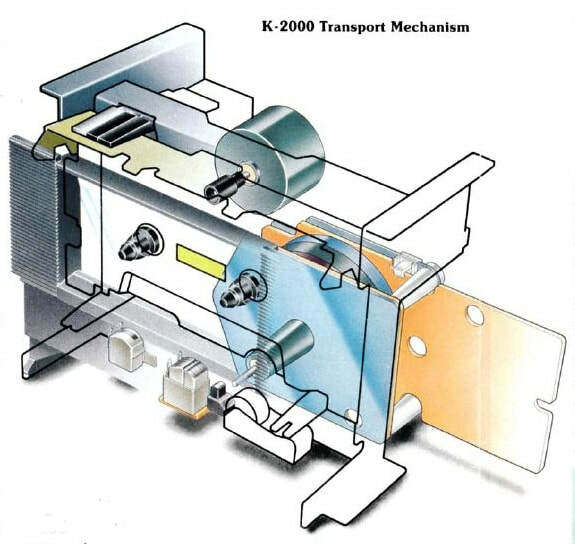 Briefly, the K-2000 and K-1000 incorporate a speially designed two-motor, direct drive transport mechanism for smoth, silent precision, and three-head (sendust) reproduction system. 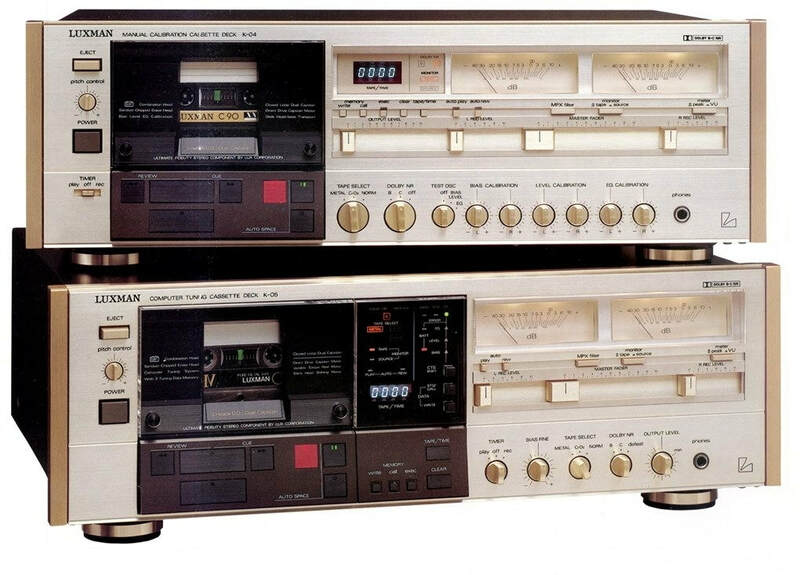 Both decks employ a new Yamaha breakthrough - Linear Electromagnetic Transduction. 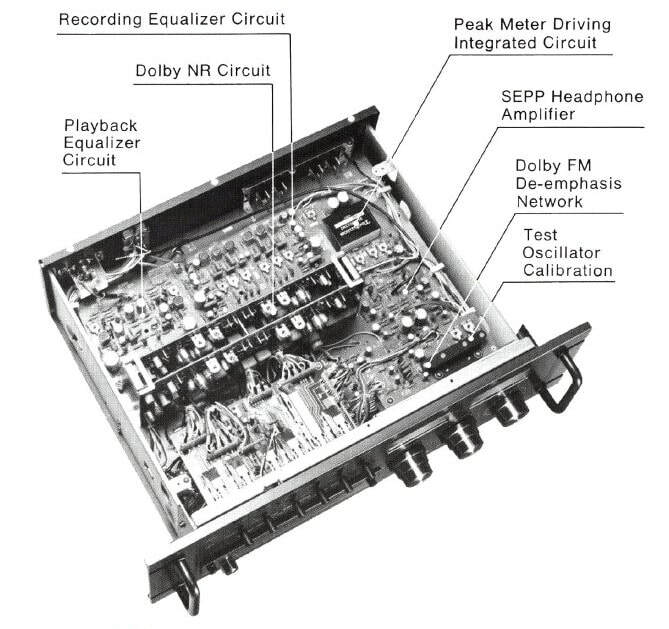 This new system extends high signal transmission linearity to the actual point where a signal is transferred from the head to the tape - a previously uncontrollable area in the recording chain. 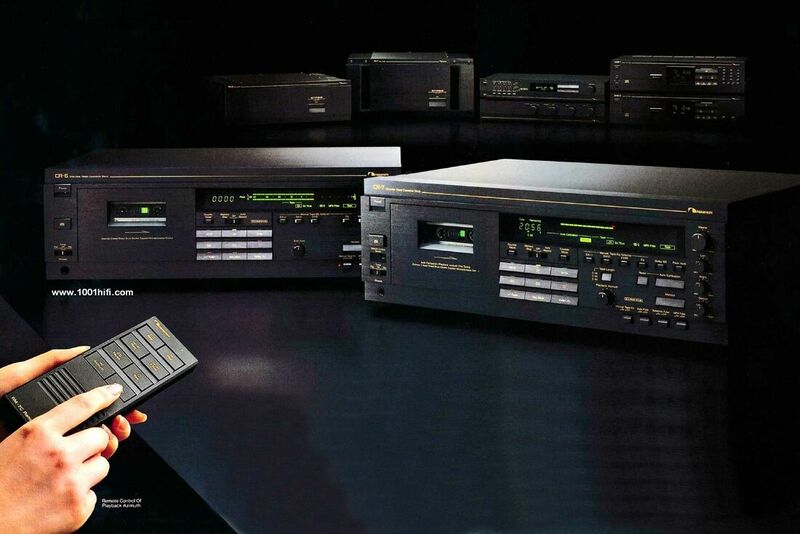 Then there are double dbx and Dolby B noise reduction systems in the K-2000 and single dbx and Dolby B in the K-1000, ORBiT (Optimum Record Bias Tuning) for automatic, precise bias level setting, a 4-digit linear real-time conter, expanded-range LED level metering with peak hold, a number of auto/memory functions and more. 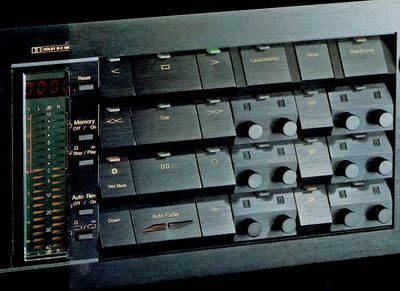 The K-2000 additionally features a unique "monitoring erase" function and a broad-range pitch control. 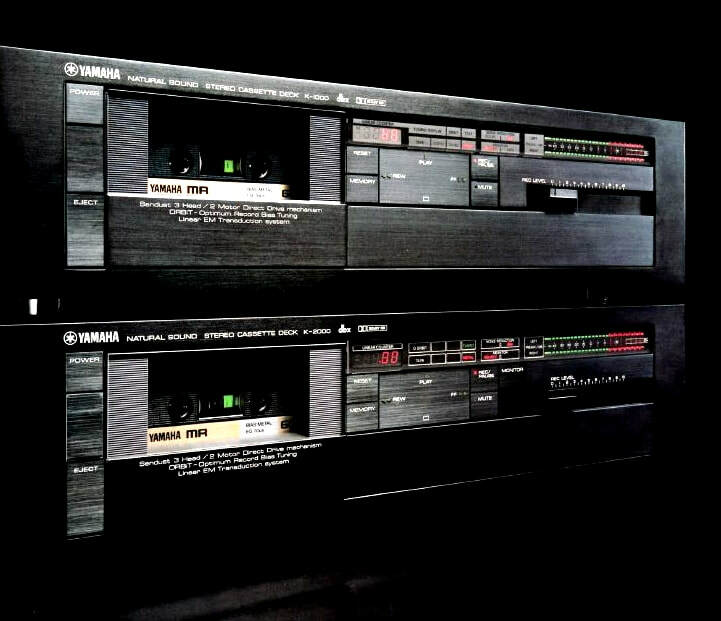 The Monitoring Erase function of the YAMAHA K-2000 is a highly original Yamaha feature that you won't find on any other cassette deck. 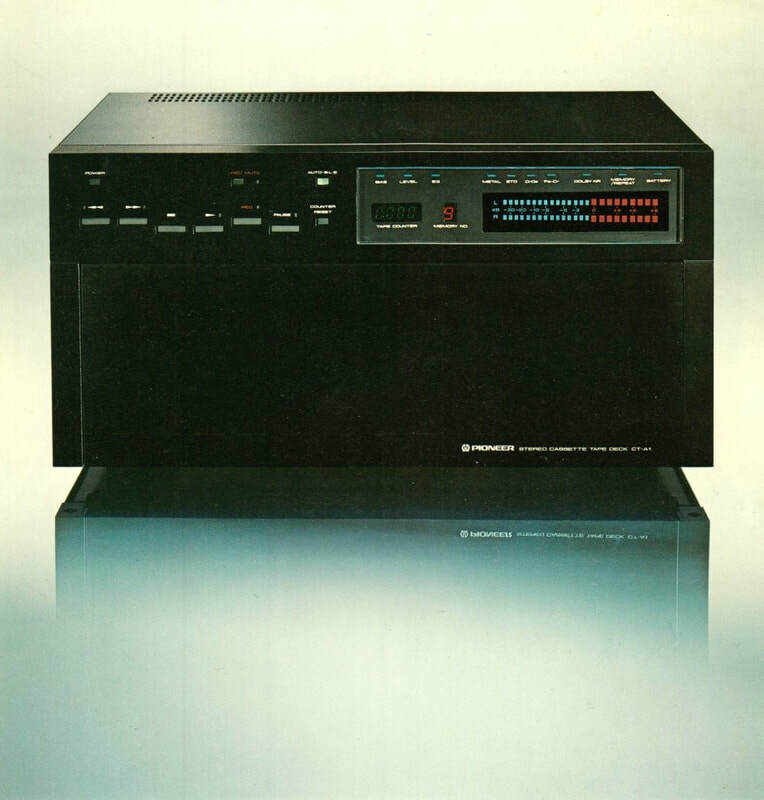 While most modern cassette decks let you insert silences in a program being recorded by pressing a REC MUTE button, the K-2000 actually lets you selctively erase portions of a program while monitoring in the playback mode. 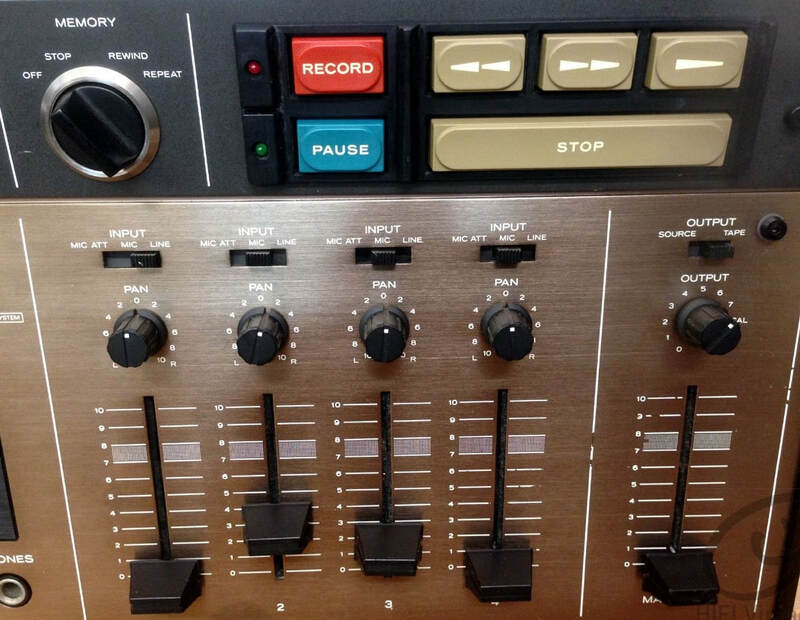 This not only gives you much greater editing flexibility than provided by the REC MUTE function alone, but it allows you to record a program it its entirety and then edit later at your leisure - a particularly useful feature for editing timer-activated recordings made when you are away or asleep. Further accesiores include a wired remote and EIA rack mount adaptors.